Pictured with the constellation artwork from Stellarium in the background this screenshot shows the opportunity to see Jupiter, Venus and Mecury at sunrise just before 7:00am Friday December 14. Join us for this event if you'd like to experience it with Wine Country Star Party. Dan Burns explains his space-time warping demo at a workshop at Los Gatos High School, on March 10, 2012. We were hired to perform a Star Party for Este Lauder / Clinique at the "Barn in Green Valley". Lots of energy, fun people, and a beautiful location. The attendees were mostly Este Lauder / Clinique staff who support the company's online sales. We met people from Taiwan, Brazil, and New York. The double doors in the photograph were "flung" open to share the drama of the telescopes with the team. We attended the Sep 29 2018 Bouchaine Wine Maker Dinner. Bouchaine is located in Carneros. The event included great music, fine food and wine, and the telescopes. It also included clouds, so we did not get to view. Our hats are off to Bouchaine host Brian Allard who really puts on a great evening. Walking this morning before sunrise was beautiful. Luckily I dragged myself out of bed early enough so that the stars were still very bright. A slight glow was peeking up in the east, but I still had time to get to my favorite open spot to see the night sky. This being so early in the moon cycle, just after the new moon, there was no moon to be seen at 5:30am. The summer landmarks are long gone by now in the pre-dawn. Even the fall constellations are westward. However, high in the sky is Orion magnificently dazzling us. His shoulders and feet outline his shape, and to the northwest, I could see his large shield. I always try to see if the Orion Nebula is visible as a hazy patch, but I think that is only in my mind. Around the winter hexagon I toured, just to refresh my memory of all the star names. Sirius, Procyon, Pollux, Castor, Capella, Aldebaran, and Rigel, oh my! To my greatest surprise, though, was Ursa Major's cup rising the in the east. Since Ursa Major is visible after sunset, and again before sunrise I am happy to be able to see almost all of the night sky in one 24 hour period. I hope to walk early tomorrow morning and see my friends again. The fourth star in the the Wine Country Star Party logo stands for "friends". From left to right, they represent, "spectacular beauty, memorable friends". We toured the planets Sunday night with our guests. 5 planets! Venus, Jupiter, Saturn, and Mars. Wait?! That makes only 4. Well, yes, we also saw the Earth. That joke is getting really old. What a perfect way to celebrate an anniversary. Cindy and Jeff joined us last night to view at the Lone Rock parking lot above Lake Sonoma. We viewed 5 planets. Venus, Jupiter, Saturn, Mars, and Earth (hahahah). We have never seen such clear views of Jupiter, including the great red spot. And, as always, it is a treat to see Saturn's Cassini Division. We had a good group at Bouchaine Winery Saturday night. About 20 of us observed Mars, Saturn, Jupiter, and Venus as well as the quarter Moon. We camp in our Forest River Wildwood and do Astrophotography in dark/remote locations. We use laptops, motor controllers, camera batteries, and other subdued lighting to get the job done and spend a lot of time charging our equipment back up during the day. 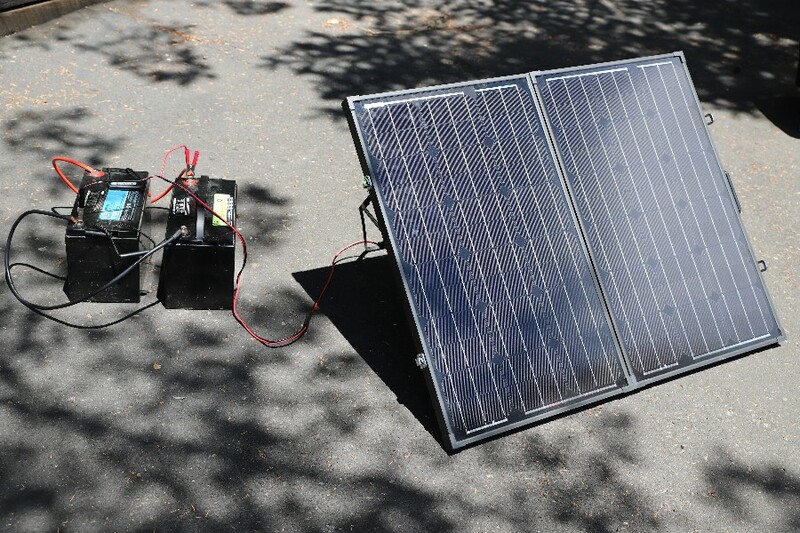 I much prefer solar panels over the Honda generator. And since we are up to midnight or later, the generator is not OK for late night use anyway. Alligator clips and cigarette lighter adapters don't cut it. Stuff can get bumped in the dark and connections get lost. We've used some cheap-o inverters from the auto parts stores, but have gone through half a dozen of those even though I am sure we did not exceed the output wattage. 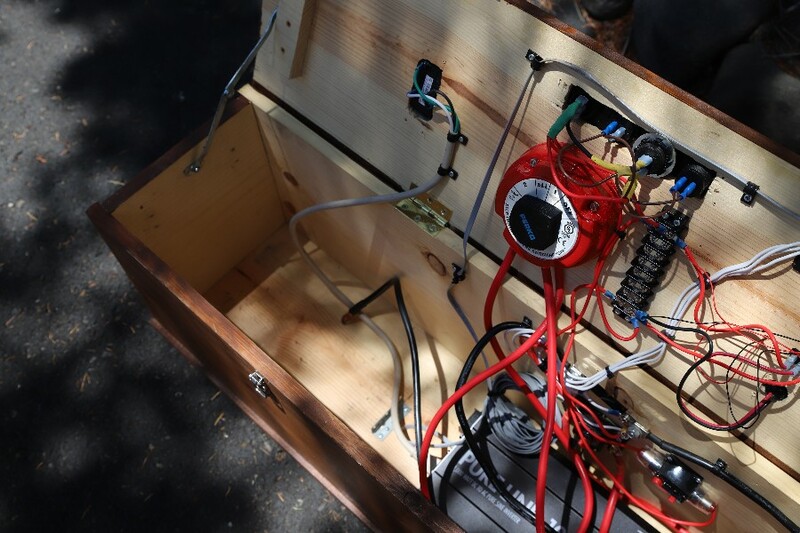 So I decided to build a box that would hold batteries, an inverter, and other accessories to make the job easier. Also the two times that our CO detector went off during the night for low battery was enough motivation to create this box. It is made of pine and stained to look a little bit like oak. The lid has an array of options. 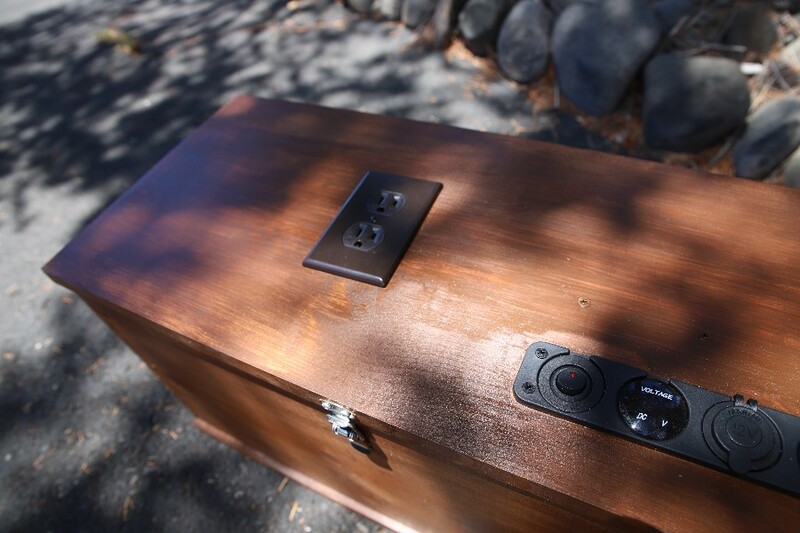 To the left in this photo is a switchable voltage display, cigarette lighter adapter and 2 USB charging outlets. At the top is the solar panel adapter for my coach so I can charge it if needed. To the far right is a switch to turn on and off the inverter remotely without opening the box. 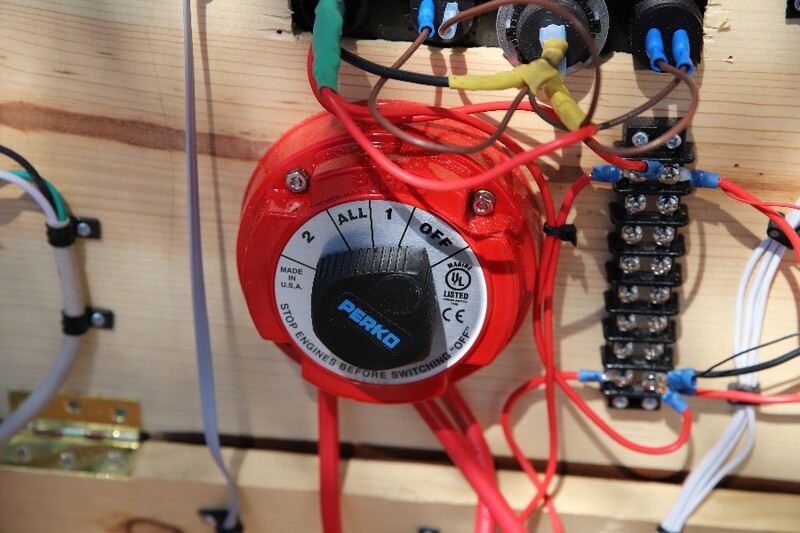 To the bottom right is an power meter that reads voltage, amps, watts, and watt hours. This is really handy. Rather than operate blindly without knowing how much power I've used, this panel gives me a lot of information. There are also a couple of indicator lights. 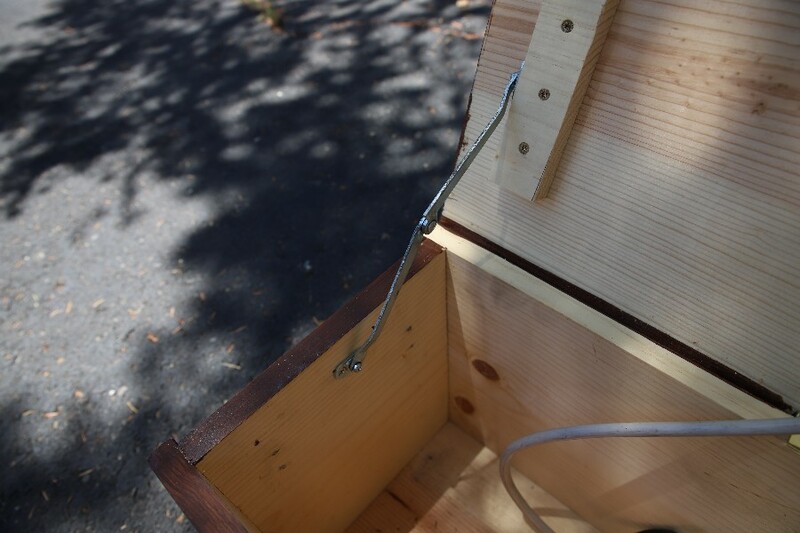 Rather than run extension cords out through the lid of the box, I put an AC receptacle in the lid. It is a heavy beast - its worst attribute. These handles are nice for carrying when the batteries are removed. 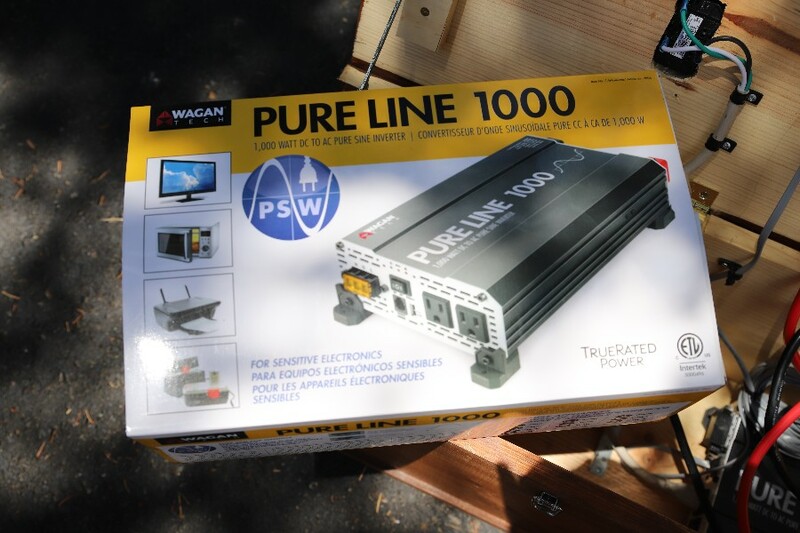 I hoist the thing up onto my truck tailgate and install the batteries and then slide the whole thing into the truck when in use. These arms keep the lid from over-extending. Inside, there a Battery #1 / Battery #2 / All switch. Reminds me of the engine controls on my Dad's sailboat. The buss bar routes power to the various elements on the lid. The void to the upper left in the photo is for the battery. 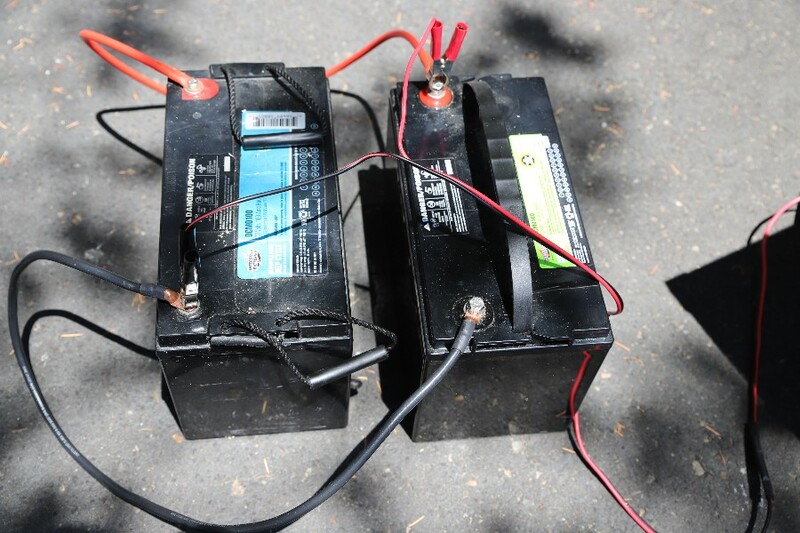 There is another spot for the second battery not shown in the photo. These are Interstate DCM0100 deep cycle marine 100 amp hour units. I chose to use a WAGAN inverter. Compared to the retail store inverters it seems really solid. A beautiful photo of the New Moon and Venus taken by our friend Angela. 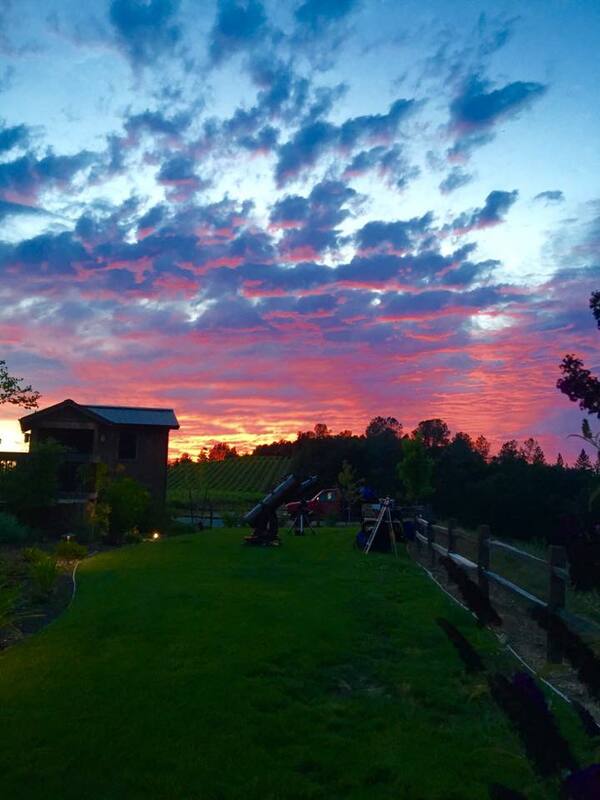 Thank you Angela for sharing your photo with Wine Country Star Party. Looking westward on many nights will reveal Venus, but it is a more rare event when the Moon is new, is forming a crescent, and is in conjunction with the Moon. Here is Wikipedia's definition of "Conjunction". Our truck and trailer (center and top) at last year's Golden State Star Party. It is a beautiful event at a stunning location. The people are nice and the group BBQs are fun. The skies were beautiful when we went in 2017. The Milky Way stretched from hoizon to hoiizon. This event is a "do not miss" happening. Unfortunately, despite my recommendation, we will not be going this year as we plan to camp somewhere else the same weekend. We offered a star party at the Roundpond Estate Sunset Palm Dinner. The Roundpond event included music, dinner, and viewing. We saw the moon, jupiter and saturn. Approxmately 140 guests attended. It was a wonderful evening. We offered a Star Party as part of a Rotary Club donation. 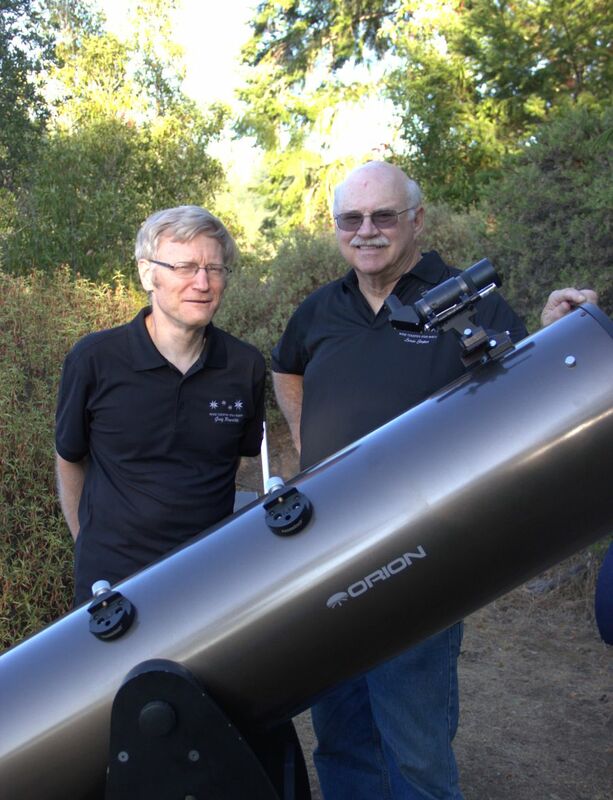 The Rotary Club of Sebastopol Sunrise auctioned off a Star Party in their "Rites of Spring" celebration and about 15 people came to Freestone for astronomy viewing. We looked at the Moon at various levels of magnification and also had great views of Saturn and Jupiter. Thank you to all for your donation to Rotary! We offered a Star Party to a wedding party at Calistoga Ranch on Tuesday. Approximately 20 family members viewed the Moon and Jupiter with us. The Ranch offered S'Mores and warm drinks as well. It is a beautiful location with a wide and dramatic sky. We had a good first night of viewing at the Bohemia Preserve. The second night clouded over and we were a little dissappouinted. Here is the dastardly fog creeping over the westward hills. My grande oak tripod is in the foreground. Sign up here for the June 16 Star Party at the Bohemia Ecological Preserve. Join LandPaths & Wine Country Star Party for an evening of stargazing at the beautiful Bohemia Ecological Preserve. We'll spread out our blankets & camp chairs, share a potluck dinner, & enjoy stories & information from experienced astronomers Jim & Linda. Stay up as late as you like & enjoy camping out at the preserve! It is a beautiful spring day in Freestone. Perfect conditions for a Star Party. The moon rises after midnight tonight. This view is from our deck. Very close to where we set up the telescopes. Linda looked out the window and said, "hey, that looks like a rocket trail". So I quickly grabbed my camera and took this photo. Then on the TV news the Reporter stated the launch that had just happened. The Rosette Nebula, NGC 2237, in the Constellation Monoceros, just to the lower left of Orion. This image is 30 sub frames of 120 seconds each at ISO 1600 stacked in Deep Sky Stacker. The camera is a Canon 6D Mark II at prime focus in a 150mm aperture Maksutov-Newtonian telescope on a Celestron CGEM-DX mount. The images were taken at the Libery Glen Campground above Lake Sonoma California on Friday February 16, 2018. A blue ("belewe"), super, full, and eclipsing Moon. "Belewe" - or betray - since the Moon was always thought to appear only once per month. Do you see the stars in the bottom photo? Frost on the roof of our gazebo this morning. 35F on the outdoor thermometer. The photo below from our photo gallery page shows the gazebo from ground level with our largest telescope. We often view from this location during our star parties in Freestone. All Wine Country Star Party guests are welcome to set up a picnic dinner for themselves or you may inquire about having us prepare a meal for you. Almost all of our guests who visit us at our home venture out into the vineyard to take a nice photo of themselves. We are in the midst of the worst natural disaster in northern California that we've ever witnessed. Fires ignited in Calistoga the night of Sunday October 8. Strong 70mph winds blew the fire into Santa Rosa. The force of fire and wind incinerated many structures and the wind blew the remains away leaving bare ground. We had a chance to go to the Advanced Imagining Conference (AIC) this past weekend. The Conference is a 3 day event at the San Jose Convention Center where you are with "the greatest gathering of Astronomers under one roof". We attended sessions on DSLR photography, Lunar and Planetary photography, and TWAN (the World at night). Also, the talk by AIC Hubble award winner Mike Rice was fascinating. A big feature for us this year was to go to the vendor exhibits. 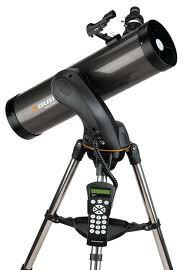 This really helped us out since we had equipment questions for Celestron and Canon. We also visited the Precise Parts booth as they built us a much needed adapter for our CCD camera recently. 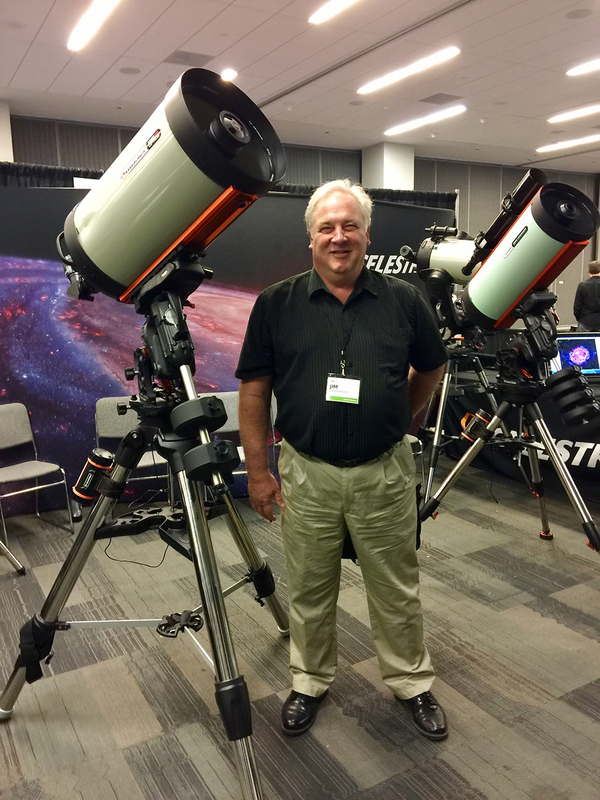 Here's a photo Linda took of Jim in the Celestron booth. This is the westward-facing view from the Vista Point near the Bull Frog Pond Vista Point. Beautiful sunset! Fortunately the clear sky charts were correct and the clouds dissappeared at about 8:30pm. Fort Ross and Cazadero are in this view. This morning we were able to photograph Venus, Regulus, the Moon, Mars, and Mercury in near perfect alignment. 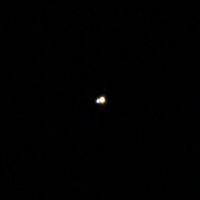 Regulus and Mars are difficult to see in the photo. Look closely. The photography required some planning. Tripods, chairs, cameras, and coffee were part of the plan. Also, we were up at 3:00am to dress and drive to the viewing location in time. Linda likes to enjoy capturing a moment in time. We were at the same location where we photographed comet Lovejoy in 2013. See our Photo Gallery for that image. This photo was taken near Forestville facing East before the sunrise on Monday September 18. The time is approximately 5:45am. Summer is gone and winter is coming! At the equinox, days and nights are approximately equal in length, but nightfall will start coming sooner. Join Stewards and Wine Country Star Party as we celebrate this astronomical event and seasonal changes with a night of stargazing! 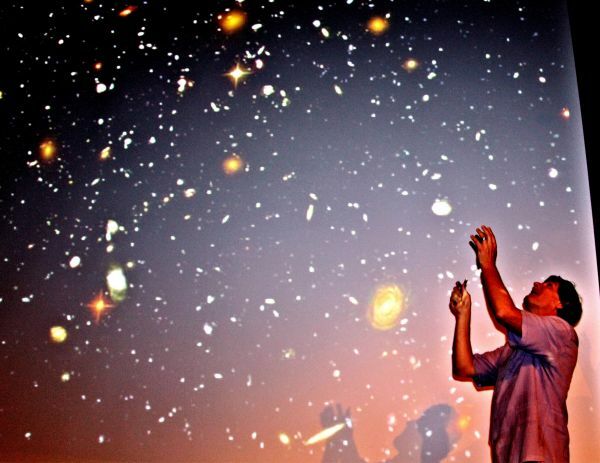 Bring the entire family to learn about the universe, solar system, and constellations. Vista Point is dark and dramatic with incredible views to the west. We recommend that families wanting to spend the night book a campsite at Bullfrog Pond Campground (www.hipcamp.com) well in advance. 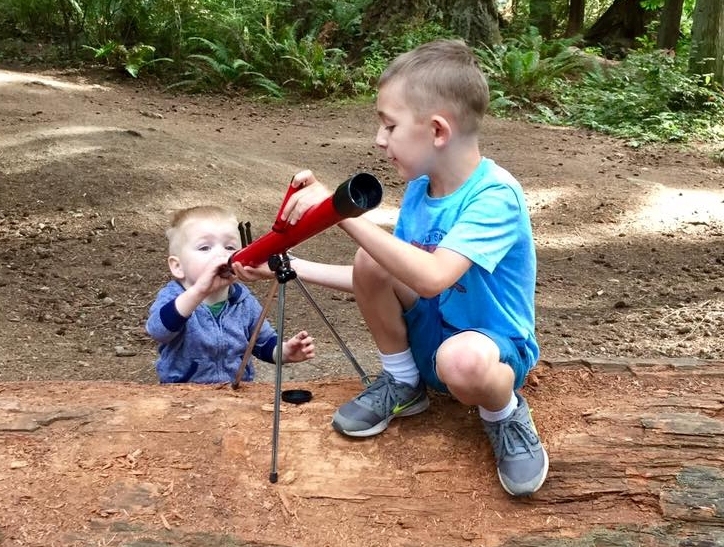 My older brother's 2 grandsons using a telescope. Makes me proud of them. I can just hear it - the older boy telling his younger brother, "no, you do it like this". Either that, or "don't touch the eyepiece!" We chose to stay in California for the eclipse, so unfortunately we did not experience "totality". This meant a small portion of the sun's light was still visible. We observed the eclipse from Lewiston CA west of Redding. This south-facing timelapse of the Milky Way and stars begins past midnight on Friday July 18 at the Cooley Ranch above Lake Sonoma. We were with Landpaths for an evening of stargazing. There are 452 frames in the timelapse sequence. Each frame is a 25 second exposure. The series continues until sunrise. We set up the camera, a Canon T2i, and left it unattended for the night. Canon's EOS software ran the camera so that the images were taken with just a few second's delay between each shot. The camera was "tethered" to a laptop and each exposure was downloaded to the computer after it was taken. Processing included 2 rounds of batch enhancements in Corel Paint Shop Pro, and some slight exposure gain in Video Velocity - the timelapse software. We had a very nice event last night with 4 guests at Solage Calistoga. The air was warm initially and then turned a little chilly. We observed Jupiter, the half Moon, and Saturn. Jupiter's Moons are always a crowd-pleaser. The Moon's craters really "popped". Saturn and its rings entertained us, as we were able to see the Casini division. This was a particularly good night for meteors. Perhaps Perseids is on its way earlier this summer than in the past? 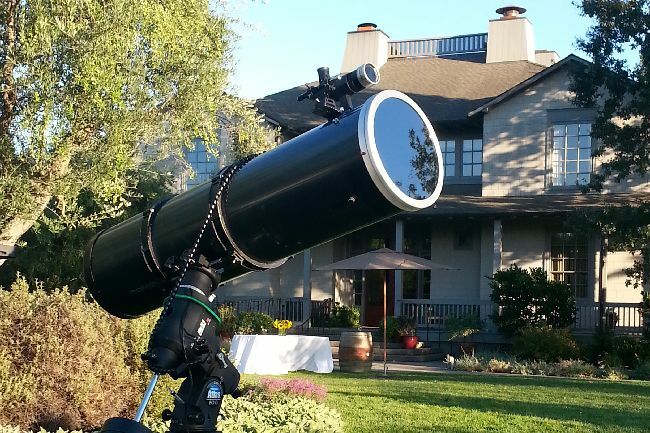 This is our second event at Solage Calistoga and one thing we notice for sure, beyond the very pleasant company of our guests, the staff is very interested in Astronomy and loves to take a look in the telescopes. On Monday September 18 you will be able to see Mercury, Venus, Mars, and the crescent Moon just before sunrise. Also present will be the star "Regulus" in the Constellation Leo. "Regulus" is Latin for "Prince" or "Little King". In Astrology, the Royal Stars of Persia are Aldebaran, Regulus, Antares, and Fomalhaut. They were regarded as the guardians of the sky. The adjacent photo is taken from "Stellarium"
Email us if you'd like to join Wine Country Star Party to witness this fabulous event. Wine Country Star Party is fortunate enough to have booked an event with Landpaths at the Cooley Ranch, Saturday July 29. Our Landpaths "hostess" is Heather Knoll, and she has always been very gracious to us and the star-gazers. 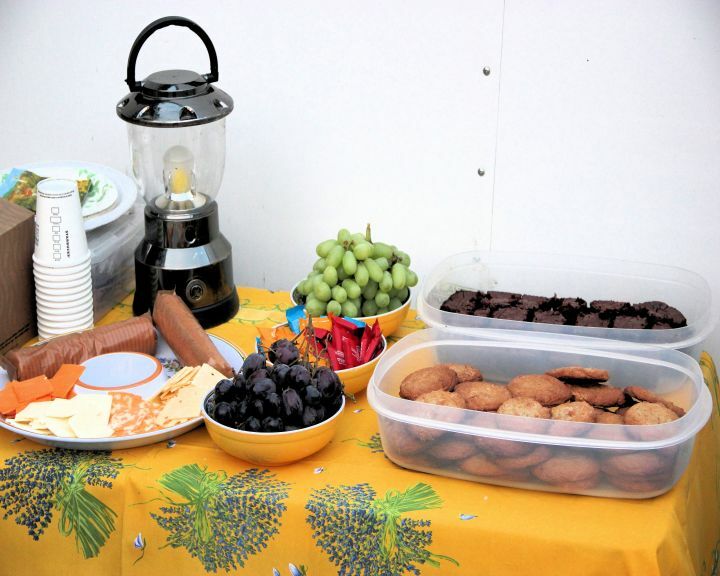 Stargazers are encouraged to bring potluck dinner items to share. When darkness falls we move from the picnic tables to the telescopes. The group size is limited so the star gazing is confined to a small enough group to allow each person lots of access to the views. This is a terrific location as it is in very dark conditions away from city lights. The dark location makes for the best astronomy viewing of faint deep sky objects. We will see Jupiter and Saturn. Also aloft this time of year are several galaxies, star clusters and nebula. The field of visible stars is a stunning comparison to what can be seen in a populous city. Views of nature at Cooley are incredible. A must see for any photographer, naturalist, or star-gazer. Particpants may stay just the night or camp overnight near the telescopes. Registration is handled through the Landpaths website. Space is limited. Father's Day is June 18th. 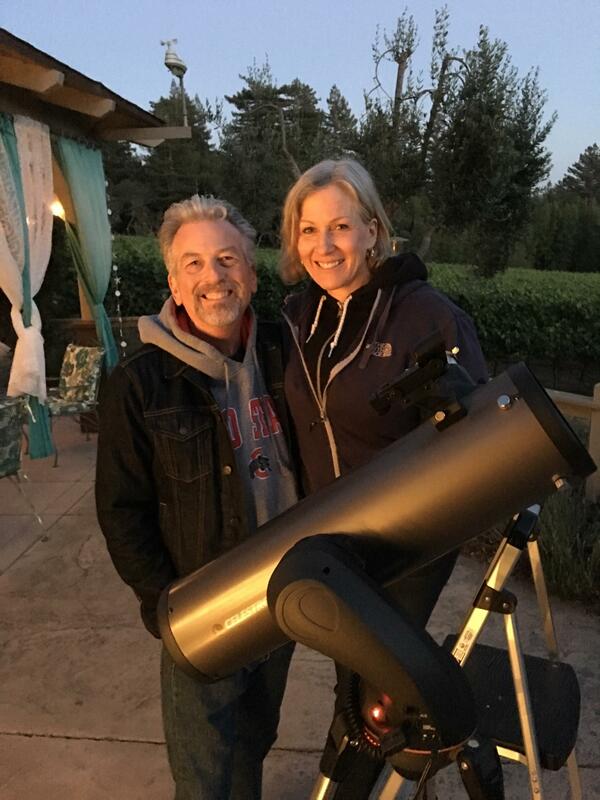 How about giving your Dad the treat of a Star Party with Wine Country Star Party? Click HERE for the opportunity to purchase a Star Party for 2 or more. Dad will be happy to receive this fun and unique gift. After all, how many ties does your Dad need? 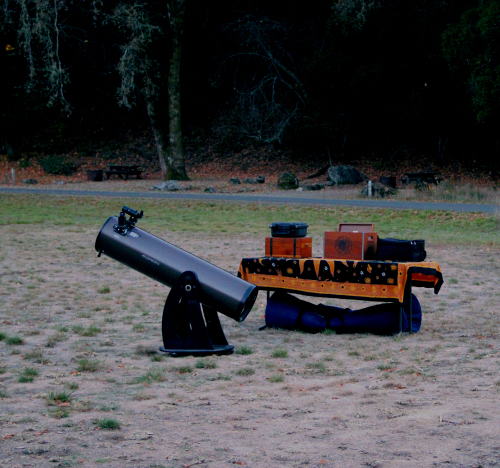 I found this photo from a Star Party we held at Napa Valley Ranch. Good times. S'Mores. Really nice people! We're heading to Cora, Wyoming for the August 21 solar eclipse. Our thought is that everyone from California is heading to Oregon, so why not take a road trip? 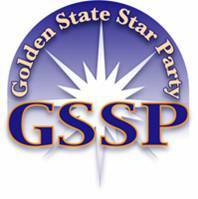 Registration for the 2017 Golden State Star Party is open. Visit the GSSP website here. For those of you who might not have their own observatory or access to dark skies, this event is a great opportunity. GSSP runs from Wednesday June 21 to Sunday June 25 2017. If you are interested in going to GSSP, let's consider camping as a group. Leave a comment to this message if you are interested and I will get in touch. The Advanced Imaging Conference (AIC) has announced that registration for the 2017 AIC Conference will be available in a few weeks. The conference date is Friday, September 29 through Sunday, October 1, 2017. Some good information here about the August 21 2017 eclipse. The rain clouds have cleared and the skies are beautiful. During my early morning walk today in the Freestone foothills, I saw Jupiter rising in the East. So nice to see Jupiter back in view. In the early morning, the Winter constellations are closing in on the Western horizon, with Orion leading the way. I saw treated to a long streaking meteor right through Orion's body. It was so nice and dark and clear this morning that I could see Orion's shield outstretched to the West. Leo and Usra Major are up. My one audible exclamation was to take in the enourmous size or Ursa Major. So much more to it than just the Big Dipper. One can get a "pre-season" look at the stars by lookin upward while it is still dark just before sunrise. We're about to have a series of rain storms this weekend. This will limit viewing opportunities. Also, the moon is nearly full which also casts so much light that we have a hard time seeing dim deep sky objects. Sometimes, the "backside" of a rain storm can yield very clear conditions and excellent star gazing as the storm pushes through and the backside cold air trails the low pressure system. We can see galaxies in our telescopes. Of course, not like below. There are several astronomical views in which one can see 2 or 3 galaxies at once. Note our friend Greg R wearing a WCSP beanie. Greg has helped us with several projects, including adding storage racks to our trailer. He also was the inspiration for the purchase of our first telescope, an "Astroscan". This video featuring John Dobson gives an excellent idea of the steps involved to build a 16 inch reflector telescope, including the mirror grinding. 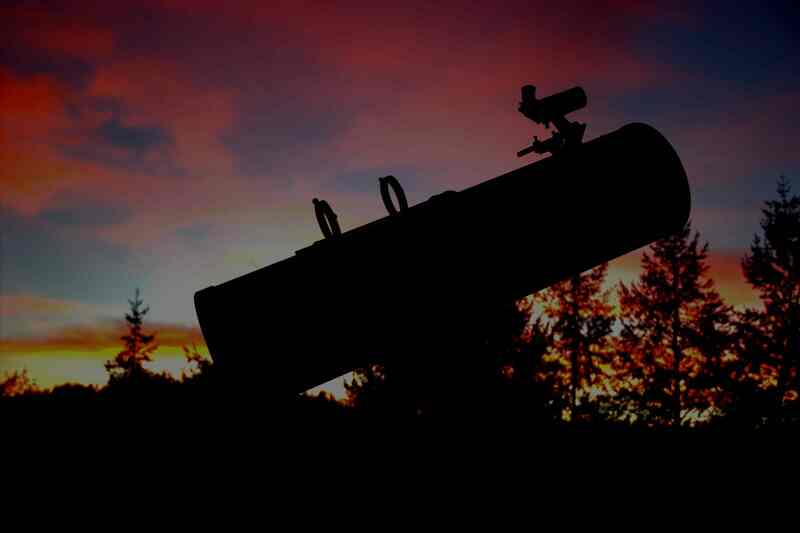 After watching the video, review the article on the Sonoma Country Astronomical Society's BLOG - http://www.sonomaskies.org/blog.shtml. The construction of that scope is nearly identical to this one, and it should be as John Dobson helped build it. We had a chance to do some photography this past weekend. We went to a remote location just south of King City. It was very dark on a friend's ranch. The adjacent photo is of the Trifid Nebula (M20). 10 images, 180 second exposures each, ISO 800. I like to call this one "The Pansies"... :-) Such pretty color! We named our business "Wine Country" Star Party since so many of the locations we visit are in Napa Valley and Sonoma County Wine Country. Look at the clusters of grapes we saw in a vineyard near Calistoga while waiting for a star party to commence. Even in early August, some grape growers are already picking their crops. We tasted a few of these grapes, but they were not so sweet yet. 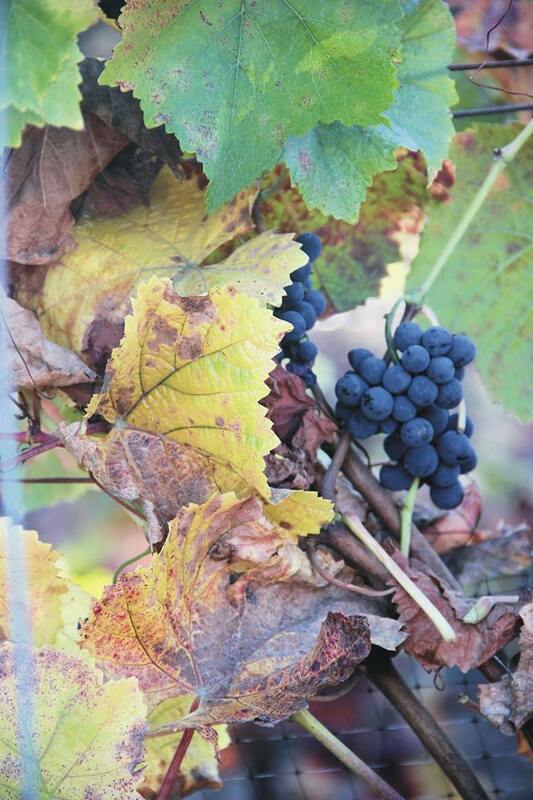 We suspect these grapes will remain on the vine for a few more weeks. We were invited to offer a Star Party Friday July 8 at Cooley Ranch. Cooley Ranch is located ALL THE WAY up the hill past the bridge over Lake Sonoma at the very top of Rock Pile Road. Landpath's coordinator Heather Knoll was our hostess. These Landpaths events are free and open to the public - advance registration required. This is the 4th time we've worked with Heather and she is a wonderful hostess. Camping was available for those wishing to stay, while others left after they finished viewing. The adjacent photo shows the participants sharing a potluck dinner before the Star Party. We were particularly impressed this time with the keen interest of each person attending. Jewel and Lorna visited us last night to try out there new telescope. We saw Jupiter, Saturn, and several nebula. Remember, "arc to Arcturus, and spike on down to Spica"
This past weekend, Wine Country Star Party held its second Star Party on behalf of Windows to My Soul. 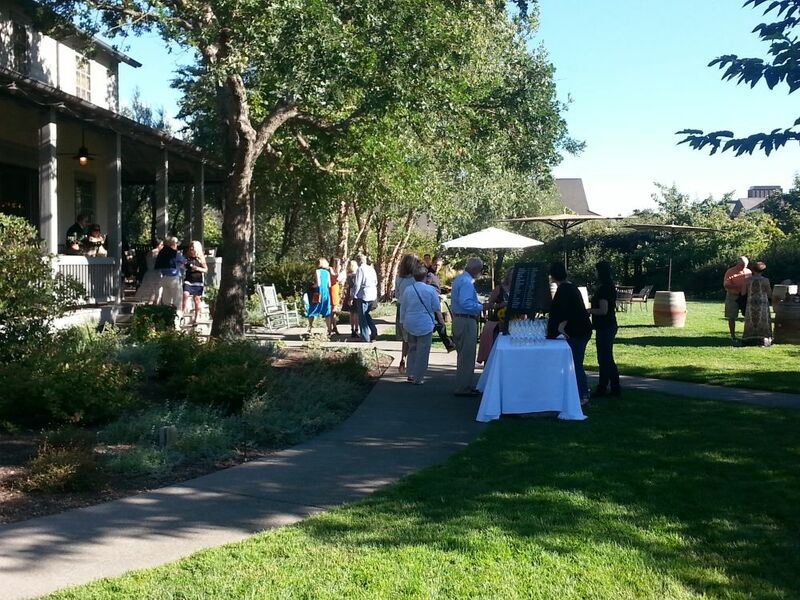 The event was at Skinner Winery in Fairplay, CA. The weather looked a little intimidating as there were clouds all day, but the clear sky charts indicated clearing after sunset. The view to the right is the observing area showing the dramatic clouds, with our telescopes in the foreground. Approximately 20 people viewed. These were donors to Windows to My Soul's Gala last fall. We will be back to Skinner in July for another event as the Star Party was a popular enough auction item to command a "double down". Bidding was aggressive enough to call for 2 Star Parties. We are happy and proud to support Windows to My Soul. We have 3 nice bookings in a row starting tonight. Tonight we will be at Calistoga Ranch in the Napa Valley with a small family. Very beautiful location off the Silverado Trail. Calistoga Ranch is a very high end and upscale property. Update: 2 families arrived - both with children. They enjoyed Smores until sunset. We viewed Mizar to see the multiple stars, Jupiter and its Moons, the Globular Cluster M3, the Leo Triplet, and Bode's Nebula. Tomorrow night we will be at the Wild Oak Saddle Club in Oakmont with a large group. This will be a first for us. Update: The event was highlighted by a very long meteor visible to the East. By long, we mean perhaps 15 seconds duration. Saturday night we will be in Freestone with a family from Santa Rosa. Thank you Julia for purchasing a Star Party from WCSP. All 3 locations are unique, and all are dark for astronomy viewing. Telescopes and sunsets are 2 of our favorite things to photograph. We had a Star Party at Skyline Park in Napa with Mark from Austrailia and Dorothy from England. This was a very nice night. We've had so much rain and cloudiness here that this one clear night was a real treat. There were a few showers and clouds just before sunset, but the skies were completely clear, as forecast, after dark. We had good views of the Orion Nebula, the Double Cluster, Bode's Nebula, and Jupiter. Mark and Dorothy are pictured to the right wearing their new Wine Country Star Party hats. As Astronomers, we look at the weather forecast EVERY day. Finally we see a stretch of days coming with sunshine predicted during the day and cloudless nights. Plus there is the added bonus that this weather pattern is happening during a New Moon. We're hoping to host some customers this Saturday night and perhaps dust off the cameras for some Astrophotography. Please read the wonderful article about Wine Country Star Party in Sonoma Discoveries Magazine. The Milky Way - our home galaxy. At night one sees an "arm" of the milky way. A 30 second exposure such as this with equipment that tracks the movement of the sky makes for a stunning exposure with bright star light. This photo taken at Ferguson Vineyards in Freestone California. The Moon and Venus this morning at about 7:00am. "In Conjunction", or visual alignment. Venus appears high in the sky when its orbit is at the extreme from alignment with the sun. In the morning, it is the morning star. As it swings all the way 180 degrees around the sun in its orbit, it becomes the evening star. On occasion, Venus and Mercury are in sync and at their orbital extremes and one can see both in the morning or night depending on the time of year. Look for Mercury much closer to the horizon, just as the sun comes up, and much less bright than Venus. This "open cluster" of stars is called the Double Cluster. It is Perseus' head, located just below Casseopeia. 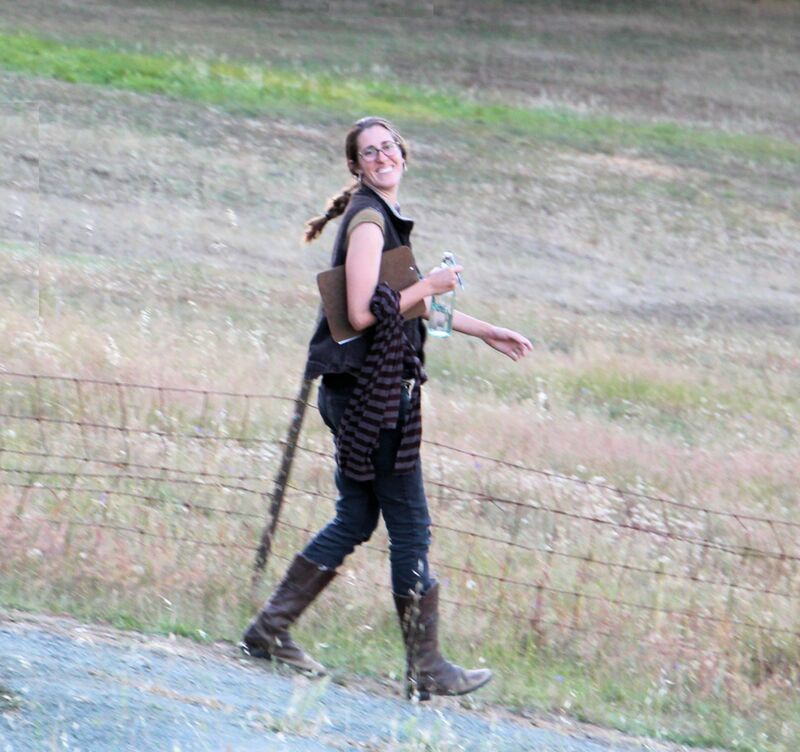 The image was taken near Freestone, in Sonoma County. A Starlight Express CCD camera was used to capture 12 photos - each "stacked" using a program called Deep Sky Stacker. Background noise from the camera was reduced by using "dark frames". We were able to take this photo last night during the Lunar Eclipse. It was a Super Moon - meaning the Moon was very close to the Earth giving it a larger than normal appearance. During the eclipse, the light cast on the Moon appears reddish as the Earth's light bends, thus making it a so-called "Blood Moon". Wine Country Star Party offered a Live Auction item to the September 12 Windows to My Soul (WTMS) Fundraiser. We were happy to hear the auctioneer "doubled down" and got both high bidders to commit to $3000 bids each. The event includes a catered dinner at a local winery. Here is some more information about the WTMS program. Are you viewing the moon anywhere this weekend? Where would be the best place to see it? We will be viewing the moon from 2 locations. Linda will be at Mount Diablo. Jim will be in Sebastopol. If you would like to hire us for an event, please send an email via our Contact Us page. All you will need is a good view to the East with no obstructions. You should be able to see the horizon. You will get a much more detailed view through a telescope. As the Moon rises, the eclipse will be already in process. It will turn red - that is why it is called a Blood Moon. It will end being in an eclipse at about 9:30pm. 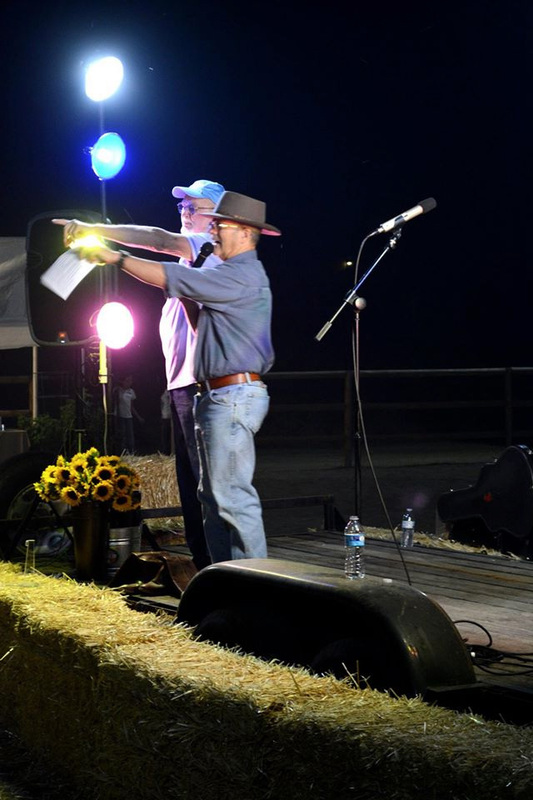 We were included in the Frog's Leap Winery Harvest Moon Party this last Saturday night. Views of the Moon and Saturn were excellent. Frog's Leap really knows how to celebrate. There were musicians, wine, food, and fun annoucemnets and toasts. Thank you Frog's Leap for including us. The first photo is early in the event as the guests arrived. The second photo is Linda's telescope with the tasting room building in the background. The third photo is Jim's telescope with the beautiful grounds as a backdrop. The Moon was a little full for star gazing at the Bull Frog Pond vista point, but the views were stunning nonetheless. We had campers and families and visitors from San Francisco. High powered views of the moon in our scopes from 40X to 350X are very pretty. 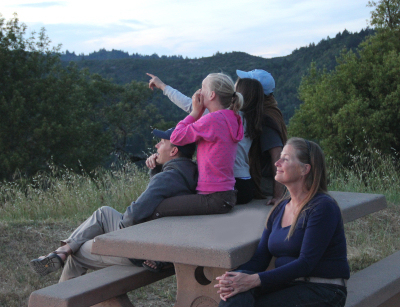 We have our binoculars set up during the twilight to view the distant ridges toward Cazadero. Quite often people like to walk out to the knoll beyond the vista point parking lot to see the sunset. Here is my best sunset photo. We held a Star Party in support of Jordan Winerie's "Starlight Supper". The location was stunning and the food delicious. The guests and staff were very fun. Approximately 80 people dined outisde and then enjoyed views of Saturn, the great globular cluster in Hercules, the binary star Albiero, and other nebula. Thank you Jordan Winery for hiring us! Thank you Jordan for inviting us to dine. Two of our scopes awaiting the Jordan Starlight Supper guests. The Blue Moon was looking pretty orange/red last night due to local fires and smoke. 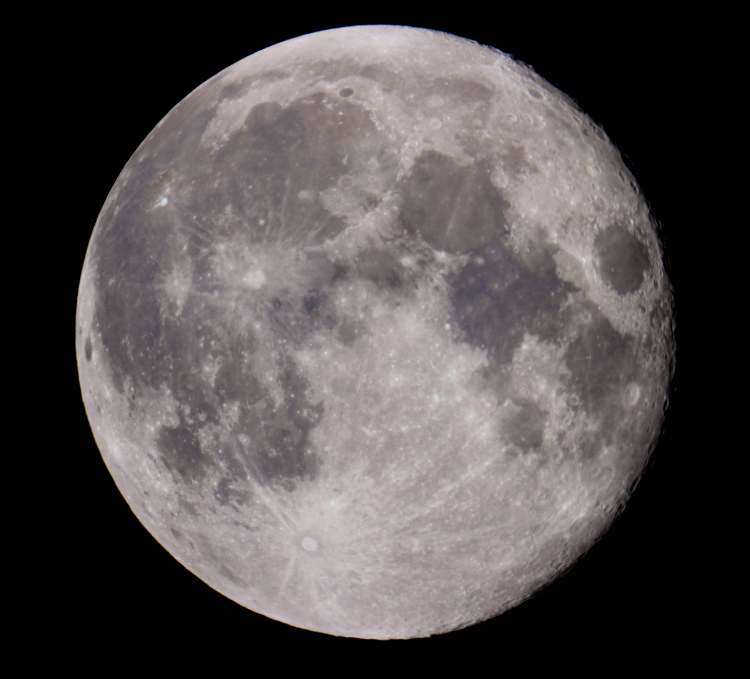 A blue moon is a second Full Moon within the same month. Called "Blue" from the word "belewe" or betray originating from the concept that there should only be one Full Moon per month. This photo was taken at the Martin Ray Vineyards star party on the Winery grounds near Forestville, Sonoma County, CA. Thank you Greg and Loren for helping out last night. We could not do it without you! There is a certain style displayed by each Astronomer as they assist our guests at the telescope. Loren is very knowledgable about the sky and stars. He confidently points the telescope and explains the view with great passion. Greg is very attentive to the view and the telescope pointing accuracy. He patiently reminds each person about the location of the eyepiece and best practices to enjoy the moment. Check out those WCSP logo shirts! You guys are stylish! We held a Star Party and Astronomy slide show at St. Dorothy's Rest last night - a fun and exciting event. The evening commenced with a slide show. This was a good warmup for the 50 campers attending this week's sessions at SDR. Then the campers moved by cabin to the exquisite viewing location just past Lydia House. This is a part of the SDR property facing North. We had good views of the moon, saturn, and albiero. This was our second event with SDR. The team there is really hospitable to us, loving to the kids, and all around great to be with. St Dorothy's is located in Camp Meeker. The property and views are beautiful. The moon and venus in conjunction over the Cazadero coast. Jupiter is to the right of the Moon and Venus - somewhat hard to see. I had the pleasure of participating in a "star party" put on by Linda Harmening Sinkay and Jim Goodenough. The sky cleared in time to see Venus, Jupiter, Saturn, and many stars and galaxies. A great time and highly recommended. And, now I can find the Little Dipper! Thanks to Linda, Jim, and the Sebastopol Area Senior Center! 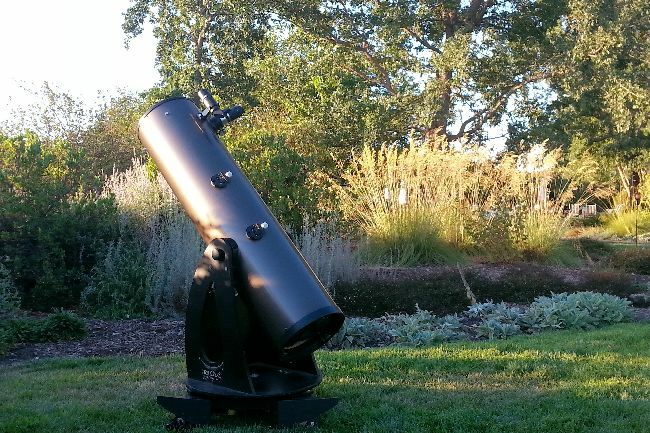 We were invited to bring our telescopes to Patz and Hall Winery in Sonoma. Thank you Tiffany for hiring us. This was part of a live auction item / fundraiser. 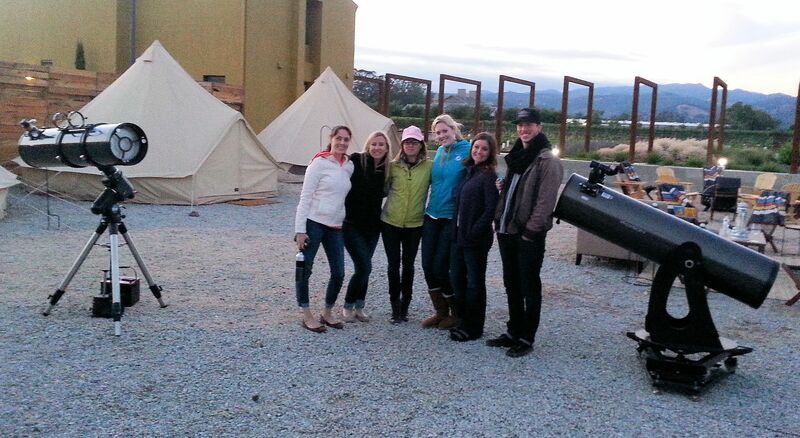 6 women from New Mexico bid to Glamour Camp (Glamp) and toured the area. Their first night included Wine Country Star Party. Lots of fun viewing Venus, Jupiter and Saturn. There was even time for 'smores'. Those really fancy tents were provided by Shelter Co. They were complete with a bed, chairs, lamps - the works! Plus couches and lanterns were placed around the area to give the outdoors a homey feeling. Have you heard of St. Dorothy's Rest in Camp Meeker, CA? It is a 550 acre paradise where summer camps and retreats happen. Wine Country Star Party is delighted to be part of their team for two very special camps this summer! The first one is this week, a 'no cost' summer camp for children who have had cancer or a blood disorder, and also for their siblings! < How cool is that? The siblings get to come too! We can't wait to thrill the kids with the wonders of the universe. 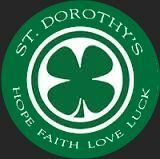 Be sure to think of St. Dorothy's Rest for your next retreat. It is truly an incredible place, right in our own back yard, Sonoma County! Thank You Heather Knoll for hostessing us at Rancho Mark West last night for a Star Party with 20 Landpaths guests. Rancho Mark West is close, dark, and dramatic. We are grateful for the excitement and fellowship with the guests. Thank you Jim and Betty Doerksen for allowing us access to the property. 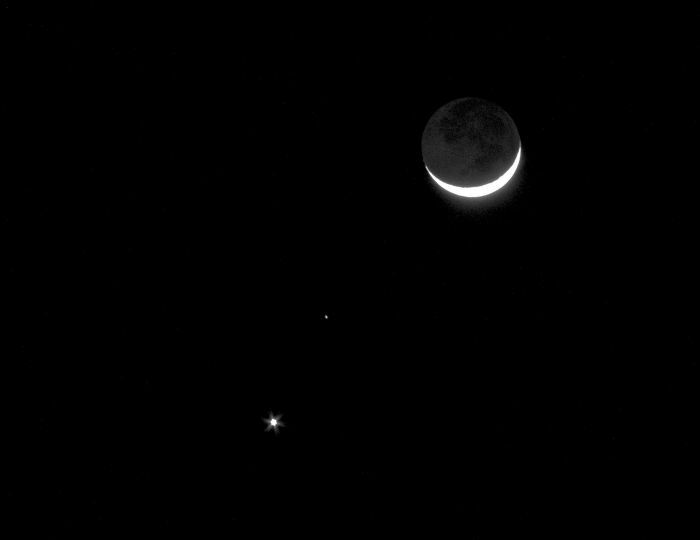 We got some nice photos of the Crescent Moon, Jupiter, and Venus this weekend. We had a fun event at the Martin Ray Winery near Forestville last night. Martin Ray's Wine Club enjoyed wine and hordouvres while the sun set and then came outside to view Venus, Jupiter and Saturn. For the Astronomy enthusiast, we were able to see Saturn's Cassini Division. The participants really enjoyed the viewing, and we hope to work with Greg Ray of Martin Ray again in the future. Thank you as well to FORK Catering for taking such good care of us. The Martin Ray Pinot was exceptionally good. We will be holding a Star Party next Thursday June 18 hosted by Landpaths at Rancho Mark West just north of Santa Rosa. Here is the link to the Landpaths website if you'd like to register. The Rancho Mark West property is one of more than 25 properties that LandPaths works with. Operating since 1996, LandPaths' mission is "to foster a love of the land through public access, environmental education, and land stewardship." Here is some information about Rancho Mark West. The Ring is very interesting, In larger photos, one can see a central star that provides all the thermal energy to heat up and excite the circular cloud of gases. The Lagoon Nebula - M8 - a star nursery. The bright white central area is filled with stars so energetic that they light up and excite the surrounding cloud of Hydrogen gas. 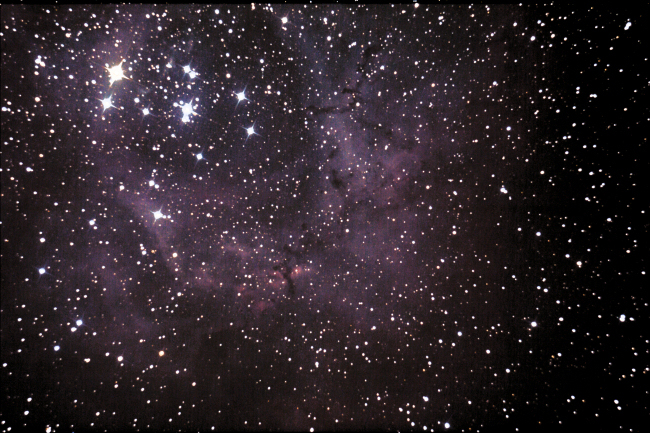 The more distinc cluster of stars slightly below and left of center are young stars that were born in the Nebula. The Dumbbell Nebula - M27 - the remnant of a star. So named because is looks like a dumb bell weight. We think it looks like an apple core. We hosted a wonderful couple from Virginia last night at Napa's Skyline Park. Thank you Loren for helping out with the Star Party. Despite the clouds, the skies cleared enough for good viewing of Venus, Jupiter, Saturn, the Moon and several deep sky objects. Napa's Bottle Rock event did not prevent us from using the Park. We are grateful to the Skyline Park Staff for being so hospitable when we arrived. M101 is visible in the telescope and stunning in photography. It is 21 million light years away. Near the last 2 stars in the handle of the Big Dipper. 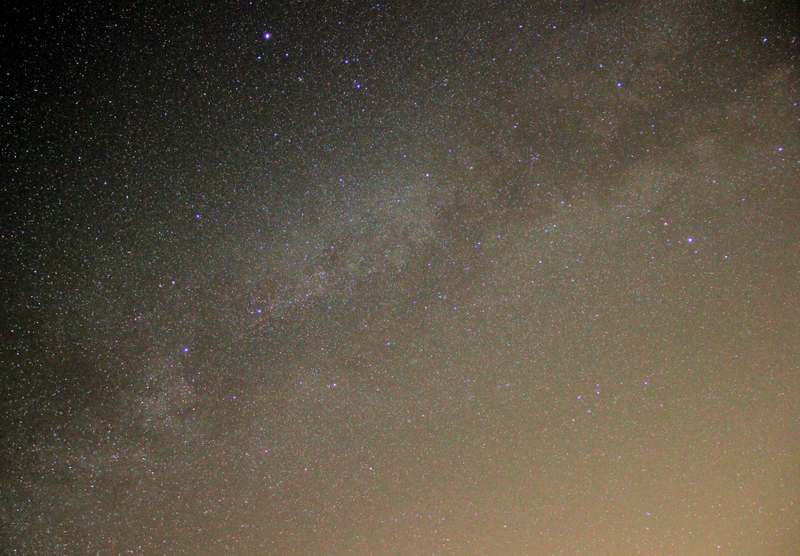 Taken during the Sonoma County Astronomical Society's Star Party at the Liberty Glen Campground near Lake Sonoma. We had an exciting Star Party at the Cooley Ranch above Lake Sonoma Friday night. Thank you Landpaths and Heather Knoll for hosting us. We were able to see Venus and Mercury after sunset. Juptier was high in the sky all night. At midnight Saturn displayed its beautiful rings. It is a treat to be at the Ranch. The Landpaths guests are always a joy and the viewing in such a dark sky location is wonderful. We were eventually able to see all of Jupiter's Galilean Moons, as one peeked out from behind the planet after a few hours. The ellusive Cassini "division" was also visible. This is a black "pinstripe" between the inner and outer rings of Saturn. The inner ring materials come from the planet and the outer ring materials come from Saturn's moons. The "division" is visible in our telescopes when the seeing conditions are best. We all camped at the Ranch. After a night of viewing, we are able to just cover the scopes and sleep. I am glad for the tarps as fog rolled in and soaked everything. We had a Star Party benefitting Windows to My Soul. 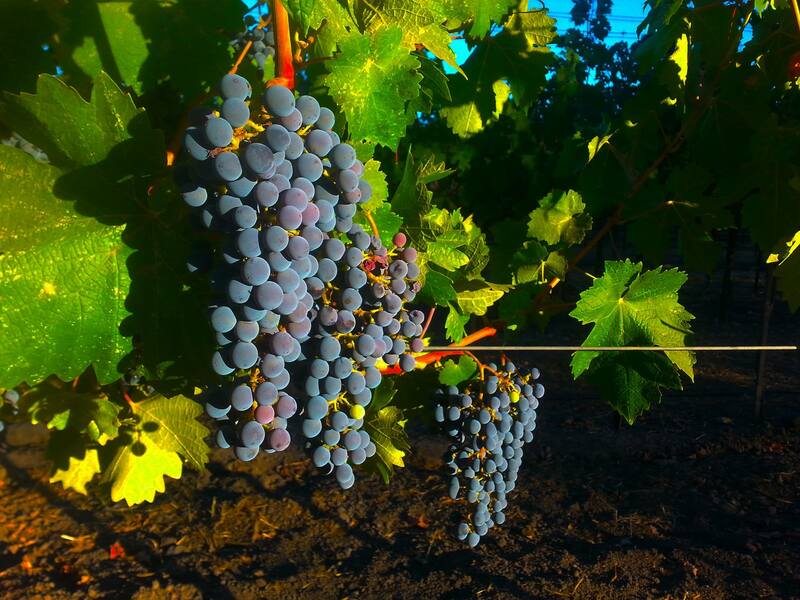 This photo was taken near Mount Aukum, east of Sacramento at the Il Gioiello Winery. 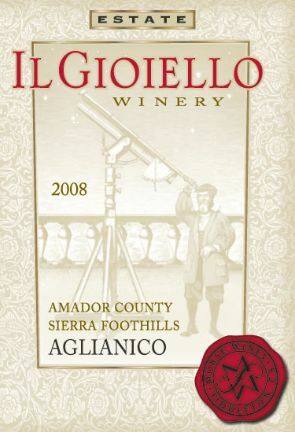 Note the cool telescope on the wine label. Estate owner Robert Morse attended the event and explained the origins of the name he chose for his vineyards and winery. See the Wikipedia page for Il Gioiello (The Jewel), Galileo's home from 1631 until his death in 1642. The Windows to my Soul program is run by my Sister in Law, Cindy Hodge. 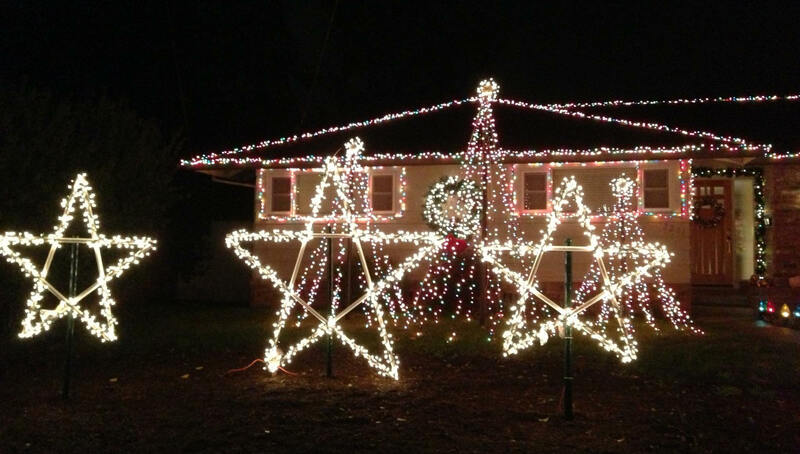 We were happy to donate stargazing to a bidder at Cindy's fundraiser last fall. The star party was preceeded by a wonderful 3 course dinner near the vineyard. The skies were nice and dark. We are so used to light pollution in Sonoma and Napa Counties to our East, but in the Sierra Foothills, the East is the darkest. The Bode's Nebula image was troublesome. Despite the fact that we recorded over an hour of images, only 20 minutes were usable. However, the dark conditions made the limited exposures very good, and telescope viewing via the eyepiece was good also. The Rosette Nebula. Taken through our new imaging telescope. A 6 inch Maksutov-Newtonian astrograph from Explore Scientific. Taken in Freestone, Sonoma County at Ferguson Vineyards. We had a very fortuitous event at the Meadowood Resort last night. Upon arrival, the skies were cloudy and it was windy. Thank goodness for the "Clear Sky Charts" which indicated clearing. As the sun set we were treated to this beautiful view. Our guests were the "KM" family who has been visiting Meadowood for 12 years annually. They are a delightful group. We had great spirits and fun viewing. We hope to go back to Meadowood again! By the way, here's how we host our guests at our partys. Nice work, Linda! We tell our guests that we provide Coffee, Tea and "Sweet Treats", but you can see it is a little more than that! We had a little supernova of our own last night on the way to the star party. No harm done to us or the telescopes, but you should have seen the smoke! We were on our way to the Lone Rock parking lot at Lake Sonoma. I noticed the smoke just north of Windsor on Highway 101 as we approached Healdsburg. Glad to know we had a working jack and good spare. The star gazing was excellent - lots of star clusters, galaxies, nebula, and planets. Venus and Jupiter were spectacular. Conjunction of the Moon, Venus, and Mars. Photo taken in Rio Nido, California. We had gone to the coast, but the fog chased us inland to Rio Nido. There was a small parking lot near downtown where we photographed but the Moon quickly set behind the foothills. As we headed inland further, we stopped near Korbel Vineyards. 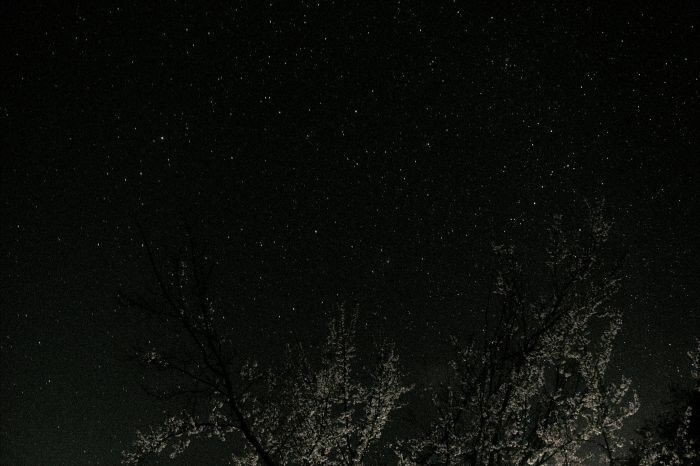 Here the stars shinining over the nearby trees. As cars passed nearby, the trees were lit up from headlights. 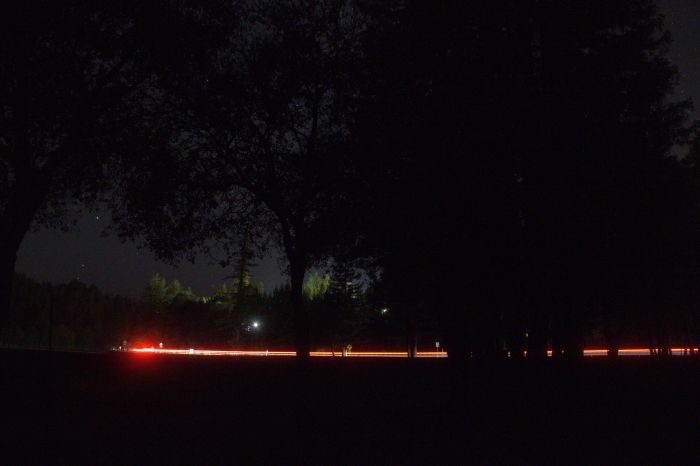 Long exposures of the cars on River Road gave us these streaks of brake lights. This was awesome! I new it was Mars but not sure about the other planet. I am glad you let us know it was Venus. Merry Christmas to all our star gazing friends. We hope to view with you in 2015. Best wishes in the New Year! Do you want to see the International Space Station fly over? Timelapse videos are becoming a favorite of mine. This was taken by Tony Rowell over Alpine Lake near Bear Valley California. My family used to vacation at Alpine Lake when we were kids. I also went to a YMCA summer camp at Alpine Lake and looked up at the stars during a campfire. This might have been the first time I noticed how bright the stars are when away from the city. When looking to the south, as in this timelapse, you can see the center of our Galaxy. It is the brightest portion of the star cloud, just above the mountains. Professor Alex Filippenko gave a wonderful talk about the awesome research done at the Lick Observatory. His mission is to save this obervatory as it is on the chopping block due to University of California budget cuts. This is shocking, as it is a vital and useful research observatory used by students all over the United States. To learn more, go to the Save Lick Observatory Website: http://ucolick.org/SaveLick/index.html . Here is the "schedule" for the lunar eclipse. All times are PST Wednesday morning October 8. The adjacent photo is from another eclipse earlier this year. NOTE: The planet Uranus will be very close to the moon moon (just slightly to the south) during the eclipse. 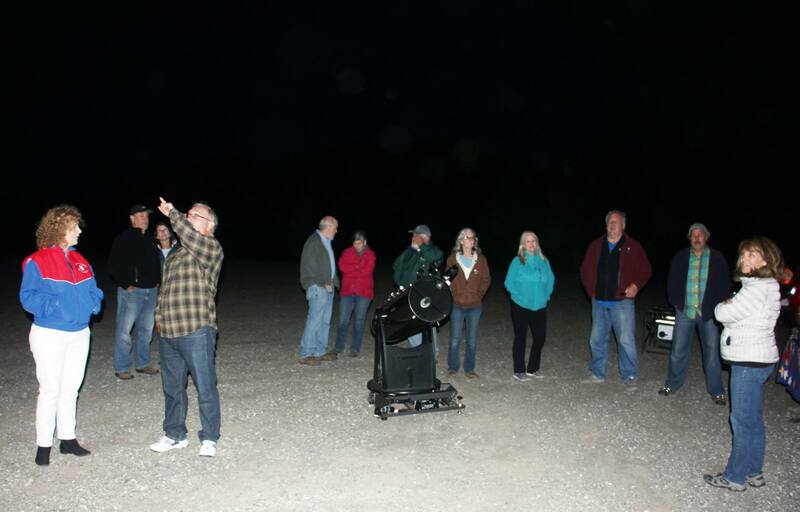 We presented a Star Party at the Frog's Leap Winery during their Harvest Moon event Saturday September 6. Frog's Leap is located in Rutherford and is on a beautiful Napa Valley location. Approximately 60 guests attended the event. As people arrived, we were set up adjacent to the area were wine glasses were presented. Linda had her solar filter set up on her telescope so the guests were treated to views of the sun with approximately a dozen sun spots. After sunset we were able to share views of Saturn, Mars, and the nearly full Moon. The toasty daytime temperatures cooled down to comfortable levels as the evening progressed. We were able to capture some audio of the participant's exclamations. Look for that on our testimonials page. Thank you to Frog's Leap. The staff was exceptionally gracious and welcoming to Wine Country Star Party. We would love to present an event on a darker moonless night sometime soon. This is a single 8 minute RAW image file post-processed in Corel Paint Shop Pro of 4 DSOs taken with a Canon T2i last night. We can improve the focus next time, and perhaps take an even longer exposure. The scope was an Orion 400mm focal length 80mm refractor that we normally use to autoguide with. And an identical scope autoguided on an Orion Atlas mount. We've been enjoying playing with taking astrophotos of wider field objects lately. We hoped to see the Lagoon and Trifid Nebulae, but the additional open clusters were a bonus. 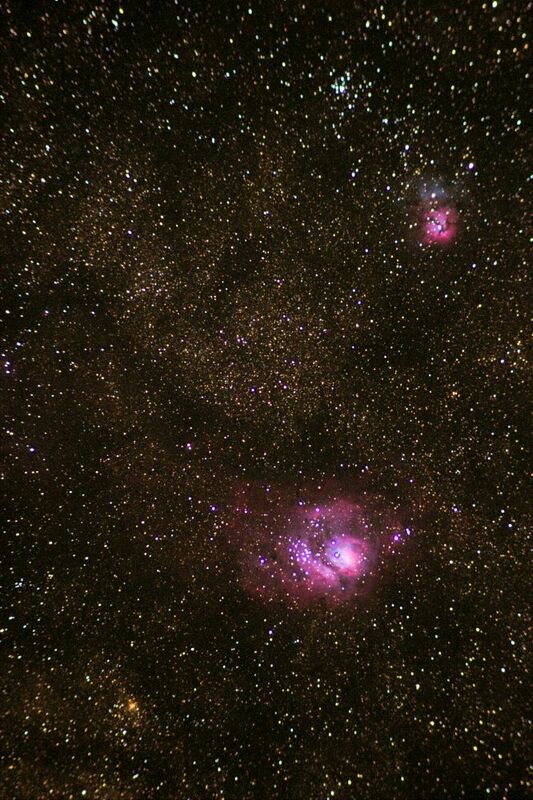 Wine Country Star Party co owner Linda Sinkay captured these images of nebulae in the southern skies this weekend. This beautiful sunset over our campsite preceeded the star party at Bull Frong Pond Saturday night. The clouds prevented the best of viewing, but Friday night was beautiful. Thanks Stewards of the Coast and Redwoods for your hospitality. Our next event with the Stewards is August 23. You can come for the night and leave by car or stay in the campsite. Camps are reserved on a first come first served basis, so plan accordingly. This is a single 10 minute exposure of the dumbbell nebula taken in fairly light polluted skies in residential Sebastopol. Sebastopol is close enough to Santa Rosa that it is not great for star gazing because of the light pollution, but the main objective was to get outside and practice taking some Astrophotos. 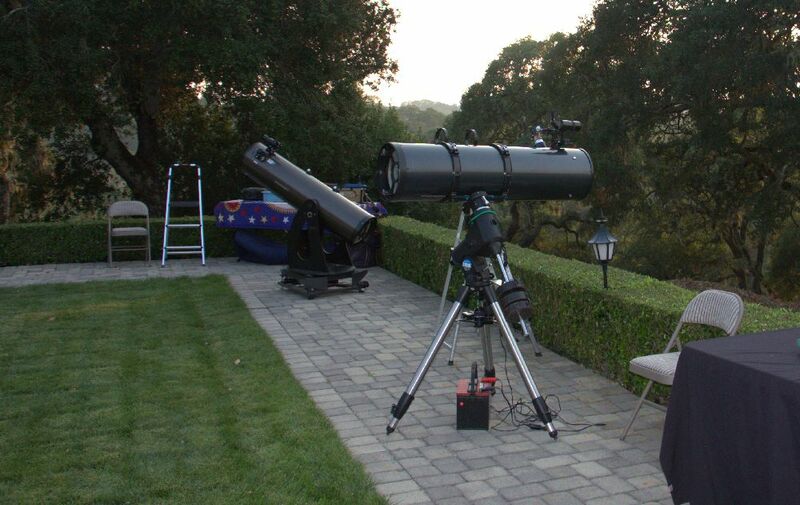 Here's a photo of one of our scopes prior to the start of the Landpaths Star Party at the Cooley Ranch. Tha Ranch is beautiful making, for a nice backdrop to some of our equipment. Thanks to all who attended. The best views of the night were of Saturn. The fellowship and potluck were hightlights for us. We're getting excited about the Star Party this Friday night at the Cooley Ranch. The Ranch is located "above" Lake Sonoma. And what is so good about that? The skies are really dark! See http://www.landpaths.org/eventdetails.aspx?EventId=20340 for more details. At this time, the event may be in "waitlist" status meaning it is full. 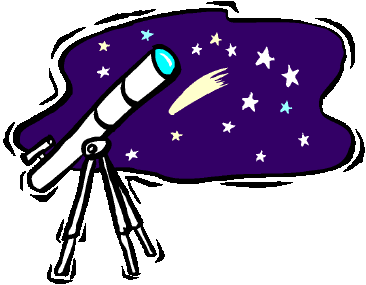 If you'd like to consider a Star Party on another night, please visit our registration page. These photos were taken Memorial Day Weekend at Howard Lake in the Mendocino National Forest. It is very dark there and the conditions are good for astrophotography. The first photo is of the M101 galaxy, near the end of the handle of the Big Dipper. 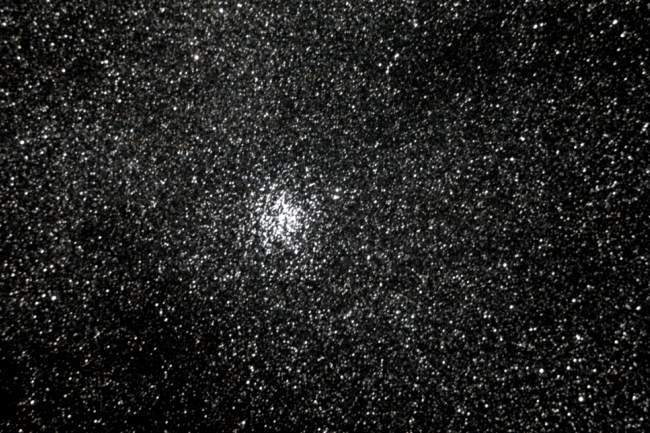 The second photo is of M13, the great globular cluster in Hercules. The location is beautiful. Lupin and other wildflowers everywhere. We had a fun event with "Piper and Chris" at the Milliken Creek Inn and Spa in Napa. It was Piper and Chris' honeymoon! The star party was adjacent to the Napa River on a beautiful lawn. We viewed Jupiter, the Orion Nebula, Bode's Nebula, the M3 cluster, and the Leo Triplet. We were proud to present Piper and Chris with a framed photo of the recent Lunar Eclipse (see following BLOG entry). We took this eclipse photo near midnight at the Robert Ferguson Observatory. Lots of visitors and fellow Docents were on hand to view the beauty. We got this nice photo of the M81 Galaxy also known as "Bode's Nebula". We participated in the Charles Schulz Museum's "Starry Starry Night" celebration this past weekend. A total of 40 people, mostly families with young children, attended. Our telescopes were set up in the lobby. Cloudy conditions made the possibility of viewing doubtful, so we aimed our scopes through the lobby at the distant collage of Peanuts comic strips. The kids loved seeing the results and the laser on our largest telescope was a curiosity for the kids as usual. After the families had dinner, we went into the theater and presented a slideshow and some videos on the night sky. We offered "prizes" to the kids for the best questions during the slideshow. Some of the questions were amazing! What smart kids we had in attendance. We had 3 framed photos of the moon, stars and nebula, and also some gold pin stars. At the conculsion of the presentation we went back out in the lobby and the clouds had broken just enough to view Jupiter. It was a great night. Thanks to Jessica for her professionalism and support. Thre are many more photos of the event on our Facebook Page. We hosted a star party at Domain Chandon for Susan H Monday night, March 24. There were perhaps 20 guess. We viewed Jupiter, Mars, Galaxies and Constellations. At right, Wine Country Star Party's Linda sinkay poses by her 10 inch Orion reflector telescope. A big thank you to Jennifer at Domaine Chandon for her hospitality. Scientists have discovered evidence that supports the theory that universe expansion began after the Big Bang explosion. “This detection is cosmology’s missing link,” physicist Marc Kamionkowski, at Johns Hopkins University, told reporters during a webcast press conference on Monday. “It’s something that we thought should be there, but we weren’t really sure. It has been eagerly sought now for close to two decades,” he said. "Jordan" at the local high school with my Bahtinov Focusing Mask. This was created on Analy High School's laser cutter. The materials were purchased in Santa Rosa at Tap Plastics. "The Bahtinov mask is a device used to accurately focus astronomical telescopes. It is named after its inventor Pavel Bahtinov. Accurate focusing of telescopes and astrographs is particularly of concern to those involved in astrophotography. The mask consists of three separate grids, positioned in such a way that the grids produce three angled diffraction spikes at the focal plane of the instrument for each bright image element (star). As the instrument's focus is changed the central spike appears to move from one side of the star to the other. In reality, all three spikes move but the central spike moves in the opposite direction to the two spikes forming the 'X'. Optimum focus is achieved when the middle spike is centered on the star and symmetrically positioned between the other two spikes. Small deviations from optimal focus are easily visible." 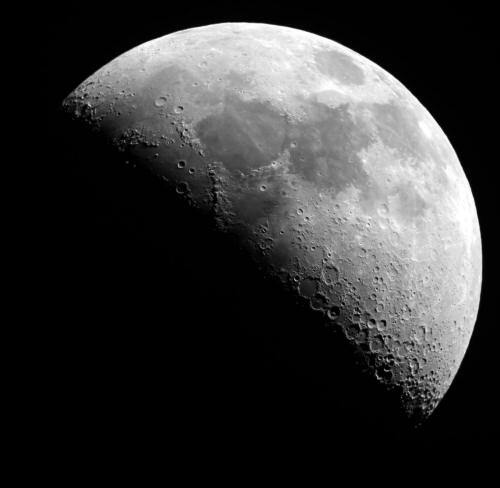 This photo was taken in Sonoma County by Wine Country Star Party's Linda Sinkay and Jim Goodenough using our Orion 12 inch reflector and equatorial mount. We took this photo last Satuday - first really good one of the new year. It is the Triangulum Galaxy. It is located very near Pegasus and the Andromeda Galaxy. There are 70 minutes of total exposure in the total capture from 60 images. We also captured "dark" images that help us reduce the noise in the photo. We were set up near Santa Rosa California in Sonoma County. Temperatures were near freezing. Bad for people but good for low noise astrophotography. Wine Country Star Party had the opportunity to present a star party at the CANVAS Holiday Party at the Raymond Vineyards Tuesday December 17. It was a great event. CANVAS - the Concierge Alliance of Napa Valley and Sonoma - invited 400 guests. Raymond Vineyard's facility is unbelievably beautiful. As cablecars arrived with guests our telescopes were available for viewing. In the early evening, Venus was high and bright. Most views were accompanied by the surprise that Venus is a crescent in its obit right now. Venus goes through phases just like the moon and is a thin crescent. Many people were fooled as they actually thought they were viewing the moon. CANVAS Executive Director Colby Smith with a big smile and a view through our 10 inch telescope. 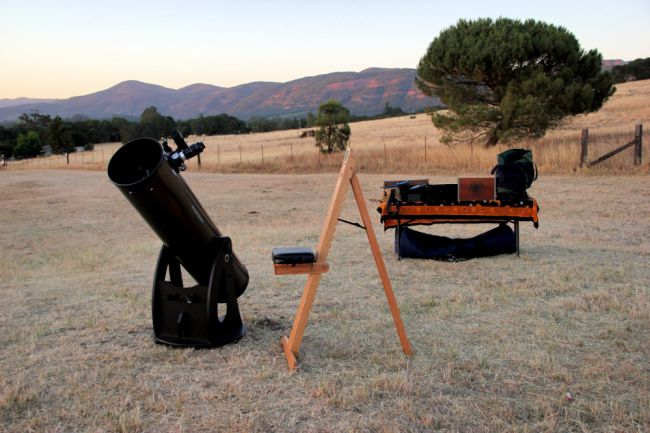 Thank you Colby for giving us the chance to present a star party to the CANVAS party guests. 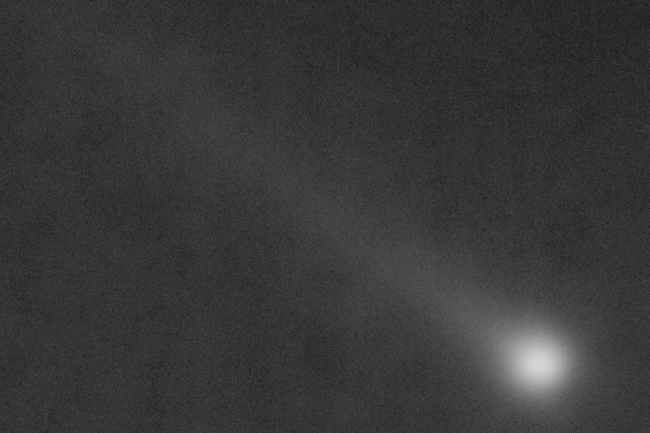 We got a nice photo of Comet Lovejoy this morning at a favorite observing site near Santa Rosa. Now that Comet ISON appears to be "dead", we are interested in Lovejoy. This photo was taken between the tail of the Big Dipper and the head of Bootes the Hunter. Our equatorial platform is complete! We are going to pick it up in Auburn next week. We finally got a nice view and photo of ISON. This was taken with our 12 inch Dobsonian with a one second exposure. This is a scope not yet on a tracking mount, thus the short exposure. It was a cold morning, viewing toward the east, just near the star Spica. We were in a field near Forestville California. We had a very successful star party last night with 4 guests from Glen Ellen and Miami Florida. The sun set and cast a glow on the eastern mountains as we waited for our guests to arrive. Although we are quite familiar with Sugarloaf, we had never run a star party in the campground. We are Docents at the nearby Robert Ferguson Observatory and we travel up and down Adobe Canyon Road reguarly to attend events at RFO. The upper campground meadow is broad and the low horizon makes for good viewing. I am sure we will return and perhaps camp. I never miss an opportnity to photograph my equipment during set up. Here is my Orion 12 inch Dobsonian reflector and my accessory table loaded with eyepieces and other equipment. Our 2 guests from Glen Ellen left with some Wine Country Star Party brochures and offered to share our story with their friends. That would be nice as we really enjoyed their company. I was concerned about the quality of the viewing since the moon was almost full and faint deep sky objects are often obscured during moonlight. However our guest's enthusiasm was high and we had a very memorable evening. Our 2 Miami guests stayed later and we were able to attach their Canon DSLR to Linda's telescope and get some decent photos of the Moon, Andromeda and the Dumbell Nebula. With so much attention placed on high magnification and narrow view photography, I was happy to take the wide angle photo of the moon below. We enjoy almost all astronomy photography, and sometimes a wide field photograph is just as pleasing as anything. Please consider reserving a star party this winter. The winter night sky objects are beautiful and we'd love to share them with you. The next good dark viewing nights are the first week of December. Jupiter rises before midnight now and the Orion Nebula is stunning. Casseopeia remains high in the sky along with the nearby Double Cluster. 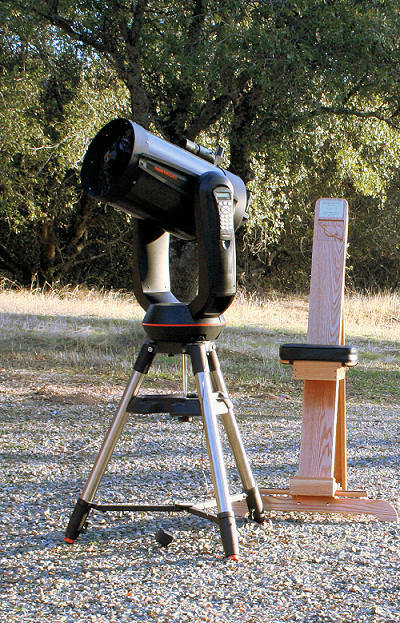 A star party makes a great holiday gift. We even have "stocking stuffer" gift certificates available. Our events are unique in this area. 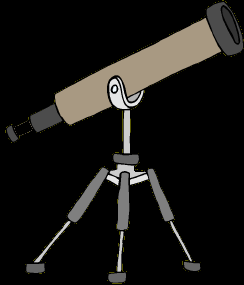 We bring 2 large/capable telescopes to each star party and also provide coffee, tea, and sweet treats. We can be contacted at 707-823-3631 or info@winecountrystarparty.com. You can book a reservation here on our reservations page. The Binary Star - Almaak - located in Adromeda. AKA Gamma Andromedae. It is approximately 350 light years from Earth. We like to think of the asterism that forms Andromeda looks like an angel laying on its side with the long lines of a gown formed by the stars. Almaak is at the end of the eastern side of the "gown". This binary pair is tough to split while vewing through small telescopes. We took this photo to expierment with the focusing ability of our 12 inch scope. 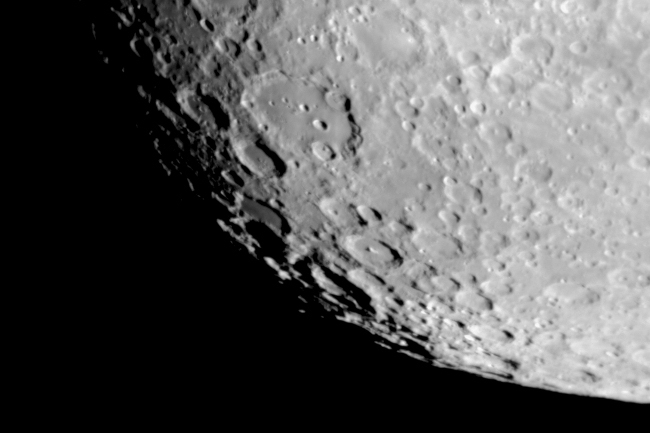 The "Clavius Moon Crater" is the feature on our Moon's surface to the upper left in this photo. Do you see the crater with the string of increasingly smaller craters running through it? 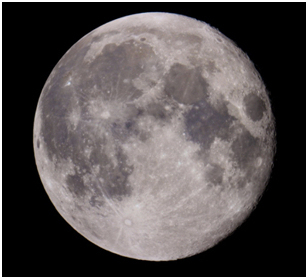 This photo was taken with our 12 inch telescope using a 2X powermate adapter and Canon T2i. One interesting thing about this crater is its size. The crater is 150 miles wide. If it was possible to stand on the floor of the crater all the way to one side, it would not be possible to see the wall of the crater all the way on the other side. Also, the crater is believed to be 4 billion years old. Here is another photo of the ongoing work on our equatorial platform. It will allow us to track objects with our 12 inch scope and also to do astrophotography. I purchased an Orion 12 inch Newtonian Reflector with a Dobsonian mount in August 2011. It is a great product and I often hear from fellow astronomers that the view through this scope is better than many other larger telescopes. In 2011 I had the attitude that astrophotography was a long way off for me, and besides "who would want to take photos you could easily find on the internet anyway?" 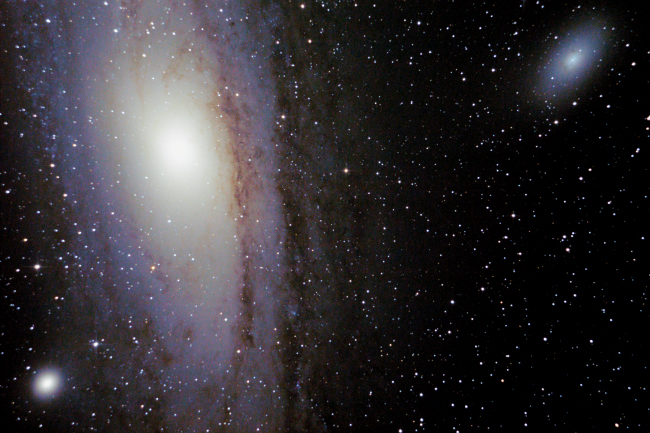 My opinion changed after my first experience capturing the Andromeda Galaxy with a 10 inch Equatorial mounted telescope. 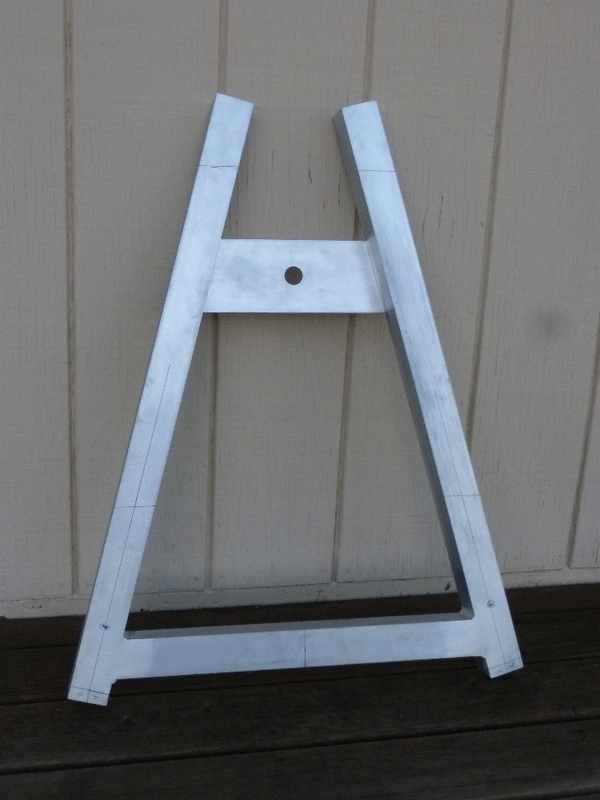 This write-up describes the efforts I have taken to get my 12 inch Orion Newtonian Reflector ready for astrophotography. One of the things Orion did to make the view through their Newtonian Reflectors so good was to “figure” (design) the entire optical path just right. This means the mirror, diagonal, and focuser are all sized so there is a minimal obstruction of the light path by the diagonal inside the optical tube. Less obstruction yields a more quality view, but there is a small price to pay. When sizing the diagonal so small, the intent is to have all of the light reflecting off the primary mirror enter the focuser and eye piece. It is undesirable to “waste” any light that might not converge to the size of the diagonal, so the cone of light coming off the primary mirror is quite small as it reflects off the diagonal and enters the focuser. In turn, this puts the rapidly converging cone of light and focal plane entering the eyepiece quite close to the optical tube. Now consider astrophotography as I did. 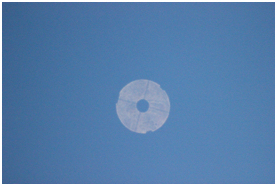 I bought a “T Ring” and adapter for my Canon T2i DSLR and attached it to my focuser, but I could not achieve focus. It was not possible for me to adjust the inward travel of my stock focuser to bring the sensor inside my DSLR in close enough to the focal plane of the telescope. The photo below shows the best I could do. If one researches online a bit, there are options. Some experts recommend coma correctors. These optics help correct distortions in the outer regions of the field of view on fast Newtonian Reflectors and are often offered as a solution to the DSLR focus problem. Unfortunately there is little documentation for each telescope and DSLR combination so you have to rely on most telescope retailer’s generous return policies to evaluate a solution and then return the product if it does not work. I returned my coma corrector as my ability to focus the camera improved only slightly. Other possibilities include purchasing a low profile focuser. I did that too. Orion makes a low profile focuser. I bought it, tried it, and returned it. I decided to get more analytical and I disassembled my focuser assembly from my optical tube and held my DSLR by hand and measured the distance from the optical tube to the face of the camera. This dimension turned out to be just over 2 inches. So much for potential of the JMI or Moonlite low profile focusers I’d researched. Each of these products is constructed such that the total height is about 2.25 inches. By the way, Dickson Yeager’s 8 inch Orion Newtonian Reflector works just fine for astrophotography with a low profile JMI focuser. And Linda Sinkay’s 10 inch Orion Newtonian Reflector is an “Astrograph” – which means it was “figured” for astrophotography so none of these issues is a problem. I started a homemade design of a very thin plate with internal threads and a matched piece of threaded tubing that was intended to focus up and down by being rotated. Certainly this combination could be designed to be extremely low profile. After calling a few machine shops and checking some of the online forums, I became convinced that my concept – a threaded “helical” focuser probably already exists. I finally wound up at “Kineoptics”. 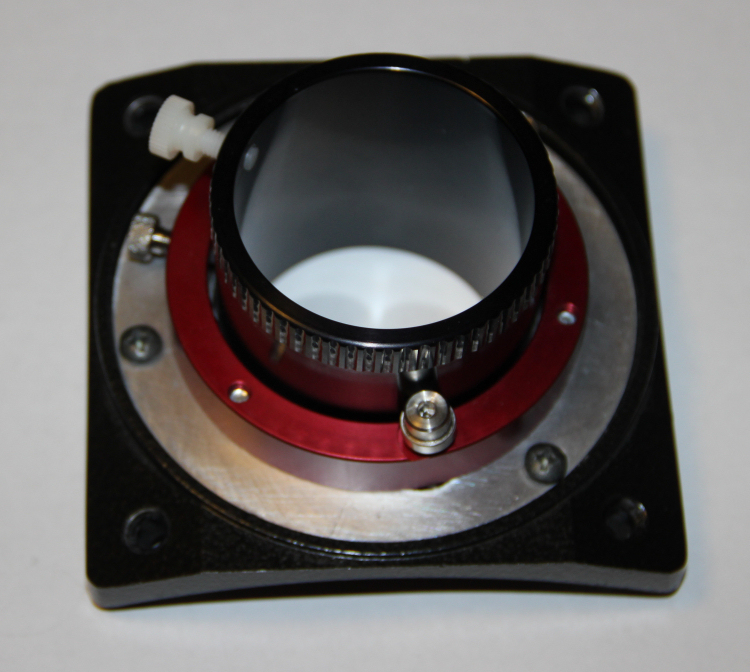 Kineoptics makes a 2 inch helical focuser – cost about $125. The product is a very short Crayford telescope focuser with helical bearings providing “extremely smooth backlash free focusing”. See http://www.kineoptics.com/HC-2.html. The Kineoptics buyer has to figure out the mounting details to integrate the focuser onto their telescope. So I purchased a used Orion focuser from an astronomer via Cloudy Nights – cost: $45. I disassembled it and am using just the base plate since interfacing to the round tube body is the most intricate mechanical interface. With the help of a friend, I machined an aluminum sheet metal plate to marry the Kineoptics focuser and base plate and the completed assembly is pictured below. I have also included a photo of the moon, sharply focused in my new design. Here is an update on our Equatorial Platform - check back to September 20 for the previous update. At that time, the basic frame was built. Now the critical curved "feet" are included and welded in place. Once we have this platform, our 12 inch Orion dob will be capable of tracking accurately for Astrophotograpy. The manufacturer tells me that this completes the top portion and now will begin on the baseplate. We are not sure about the schedule, but the original commitment was 12 weeks which would put delivery in mid November. 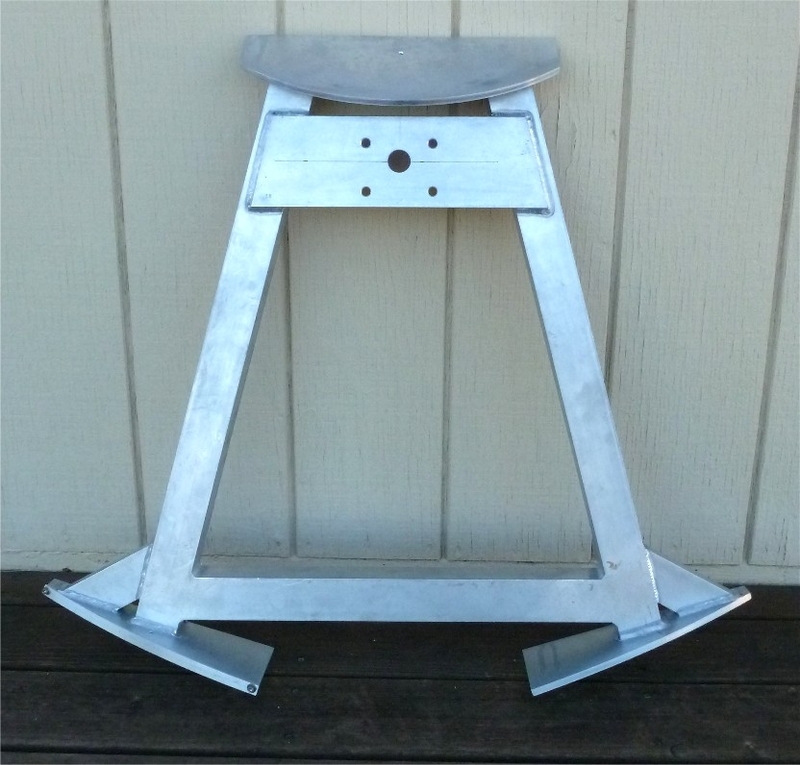 We have completed a project that will allow us to use our Orion 12 inch Newtonian Reflector for Astrophotography! Normally the response to this challenge is, "it can not be done" since Newtonian Reflectors are "figured" (or set up) for visual use. The focussed image is far too close to the telescope tube and the distance to the back of our cameras is too far to achieve focus. The solution was to build a very low profile focuser allowing the camera to reach "prime focus". Pictured here is the 3 part focuser assembly. The black base is a purchased part. It is the lower part of an off the shelf Orion Crayford style focuser. We bought this online for about half of the $90 retail price since buying the piece was far less expensive than machining it. The shiny aluminum ring is an adapter that we had machined by a friend locally. The red ring and black assembly above it are a Kineoptics HC2A helical focuser. There are no focuser "wheels" to turn. Rather, this focuser twists and causes the mechanism to focus in and out. Without all the structure and mechanical details, the resultant focuser is very low profile. Even a low profile Moonlite focuser is about 2.25 inches tall and you must add the thickness of the camera T ring to the total. Prime focus on our equipment requires a measurement of slightly more than 2 inches. Here is a photo of the full moon I used to prove to myself that focus was achieved. Here's a really good link that shows how to add Comet ISON to the object database in Stellarium. Our 10 inch reflector telescope tracks the stars beautifully via an equatorial mount. This means the telescope rotates in sync with Polaris, thus keeping all objects in the center of the field of view. Our 12 inch reflector telescope sits on a static mount. Over time, the objects viewed through this telescope drift out of view. We are investing in an equatorial platform to replace the static mount. This means both scopes will track without adjustments during star parties. The platform is being manufactured by Tom Osypowski. 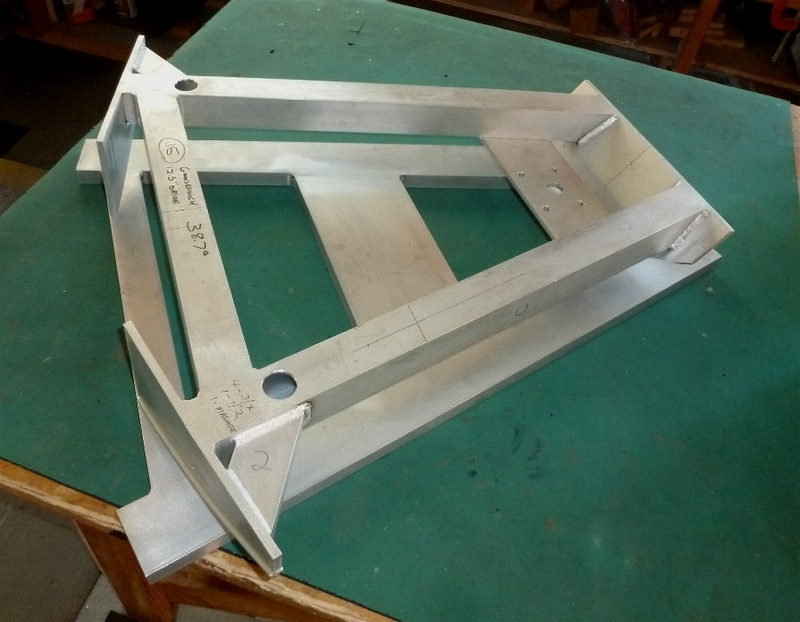 The photo on the right is the top plate for the mount - under construction. Delivery is expected this November. 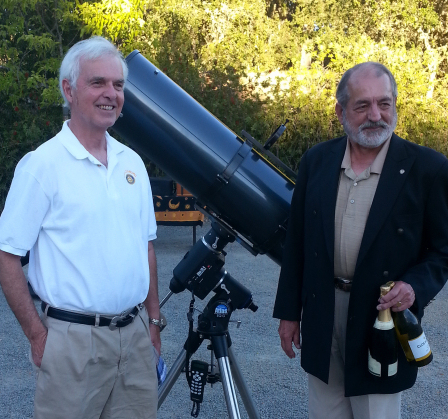 We held a Star Party last night at the Vineyard Club in Geyserville for the Healdsburg Rotary Club. The Vineyard Club is a beautiful location in Geyserville with a Club house and Lake. Approximately 40 persons attended. Dinner was served by "Healdsburger" and it was excellent. We were in the parking lot observing the moon and Saturn after dessert was served. We had another beautiful night above Armstrong Woods in the Austin Creek State Recreation area this past weekend. This was our third event with the Stewards of the Coast and Redwoods. The fog threatened slightly Friday night, but held off. Saturday night was beautiful with views of the crescent moon and venus at sunset. 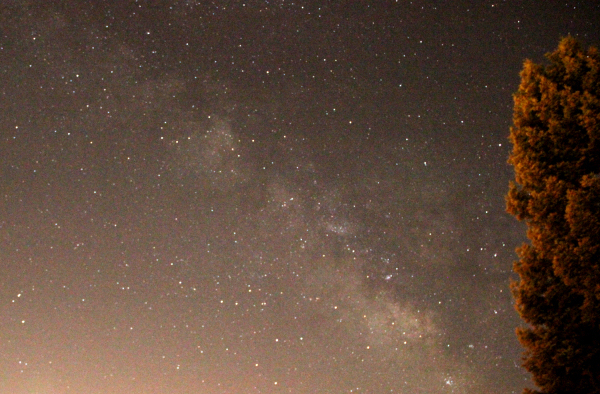 Late night views of the Milky Way and early birds from the Perseid meteor shower were excellent. The summer constellations are high and beautiful late at night right now. Even Pegasus is rising to reveal M31 (Andromeda) before we called it a night. The adjacent photo is of the Wild Duck Cluster. It is a beautiful open star cluster in the constellation Scutum. While trying to figure out why this cluster was named the Wild Duck Cluster, (because it doesn't really look like a duck to me) ;-) , I learned that it is called the Wild Duck Cluster because of the three bright stars surrounding the cluster, shaped like a triangle, the formation in which ducks fly! The flying ducks, (the cluster of stars), about 2,900 of them, are estimated to be about 220 million years old. 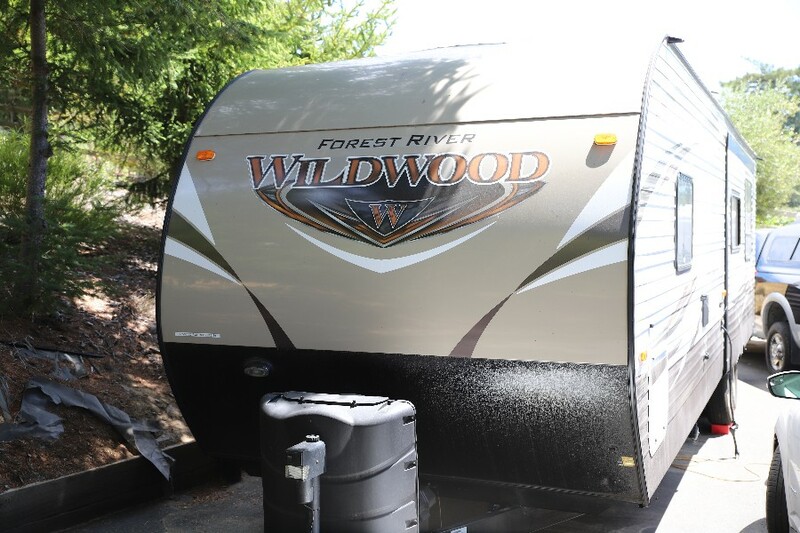 We were at Lake Sonoma west of Healdsburg at the Lone Rock parking lot this past weekend. Time was short as darkness is total at about 9:30pm and the moon rose at just before 11:00pm. 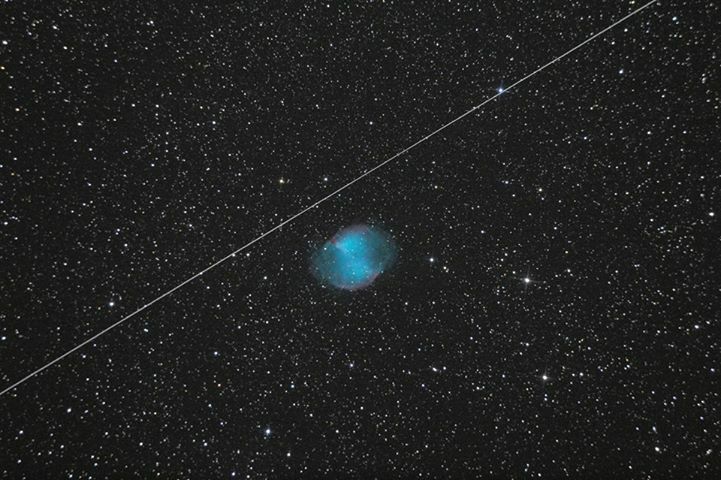 This single exposure of the Dumbell Nebula (M27) includes the trail of a Satellite. The exposure time was long enough to allow the satellite to appear in the frame and travel all the way across the field of view drawing a straight line. 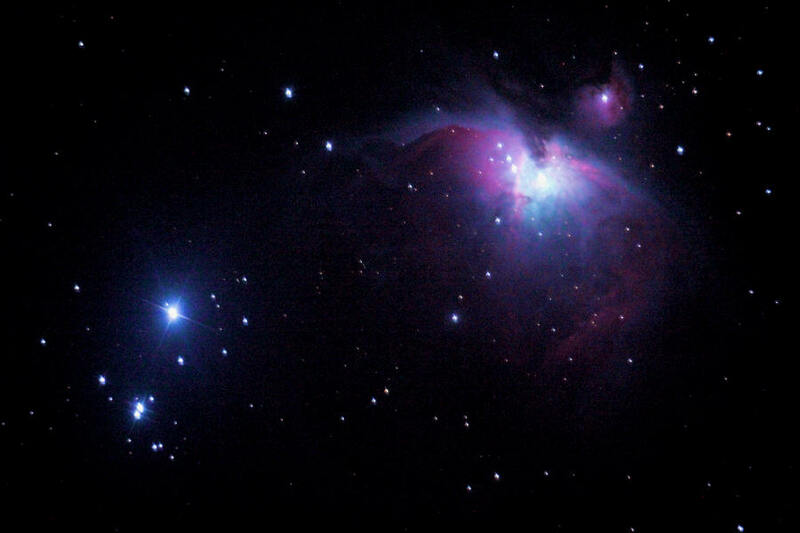 This photo was taken with a Canon T2i and Orion 10 inch Newtonian telescope mounted on an Atlas equatorial head. The setup was autoguided. We spent some time doing alignments on our 10 inch equatorial mount scope last night. We are trying to see why sometimes the objects we slew to is not in the field of view. We took this Milky Way photo at the end of the night just before the Moon rose. There are at least 6 constellations in this photo - can you find them all? We hosted Caitlin and Kapil from Texas - a very nice couple. Thanks for sharing your birthday cake Kapil! The crescent Moon, Saturn, and the Great Globular Cluster in Hercules were the standout sights, along with a nice long view of the International Space Station. Caitlin and Kapil departed before midnight, but Linda and I stayed much later after playing with our cameras and taking lots of Milky Way photos. We are having a Star Party in Napa this Friday. Please contact us if you are interested. We'd love to see you there. We were at Bull Frog Pond - above Armstrong Woods near the Austin Creek Recreation area. This sequence was taken at 1:00am. There was a strange tropical warmth as it was still 85F at 1:00am. There are 40 frames in the sequence playing back at 5 frames per second. Sagittarius and Scorpius are visible to the left and center, respectively. 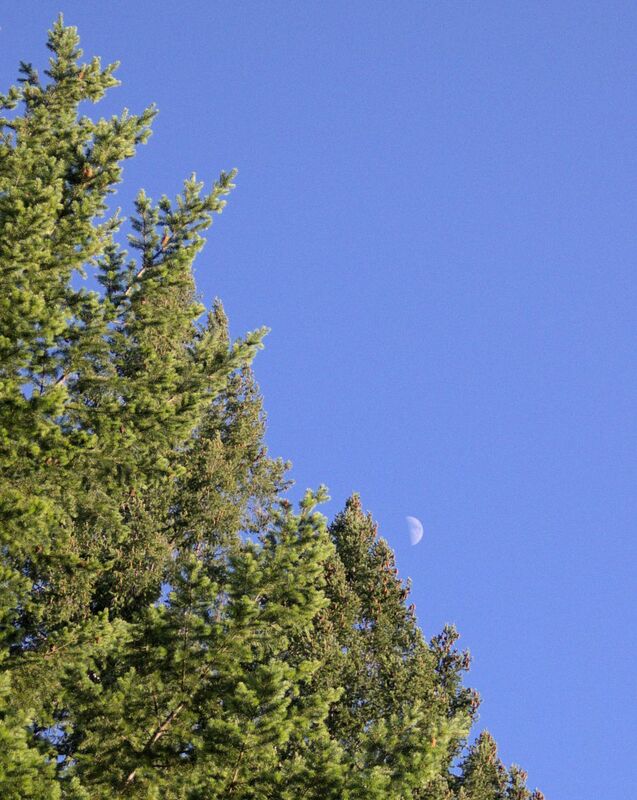 This Star Party was with the Stewards of the Coast and Redwoods. There were perhaps 20 people in attendance. Comet Ison will be perhaps the "Comet of the Century". It may be visible during daylight. If it breaks up while passing the sun, the fragments could turn into a stunning display of trailing tails. Watch the video to see how it was named and why Comets are known to be unpredictable. It is late spring / early summer. As Leo heads west and Ursa Major climbs even higher in the sky, the summer constellations start to rise from the East. 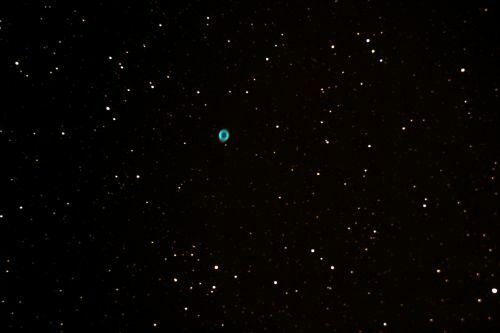 I am excited to have had my first views of the Summer Triangle, including the Ring Nebula. I see Scorpius and Sagittarius rising in the south. Late at night I see Cassiopeia coming all the way around Polaris. My views of the great cluster in Hercules are always pleasing and so was the Dumbell Nebula last night. Here comes another new moon. We hope to get another good astrophoto this weekend. I am hoping for color. 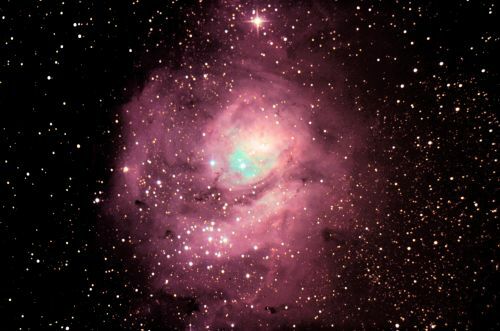 A nice colorful photo of a Nebula with pink and blue would make my week. We are planning on setting up in the Austin Creek Recreation Area - above Armstrong Woods at the vista point near Bull Frog Pond. We are doing astrophotography Friday night and a public event Saturday night - come join us Saturday. We had a great time at the scenic overlook just before the entrance to Bull Frog Pond this past Saturday. We had approximately 25 guests. This was an event in which we parthered with the Stewards of the Coast and Redwoods. The evening began with a beautiful sunset and a search for Jupiter. Jupiter is near the western horizon right now and is a good eye test for everyone as the anticipation of darkness falls. The crescent moon did not dissappoint either. It was just below Jupiter. Soon we were all looking to the west as Saturn rose through the trees. The rings of Saturn were clearly visible. The night was warm. Even near midnight, we were warm in just tshirta and light sweaters. The Robert Ferguson Observatory (RFO) is clearing out excess astronomy equipment! RFO will hold a public yard sale June 1, in the parking area in front of the Observatory. There will be telescopes, eyepieces, and all kinds of astronomical gadgets. A list of items will be posted soon. Proceeds will be used for observatory development. The conditions are excellent for star gazing in Sonoma County right now. 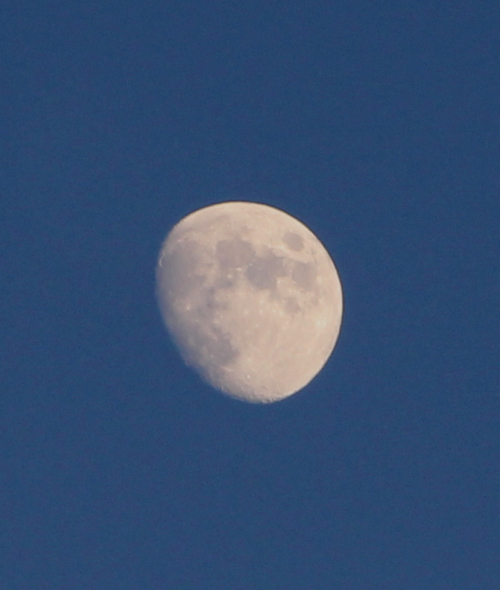 The moon is waning and the skies have been clear. And the weather is marming up, making for comfortable viewing late at night. Come out with us to view the late spring and early summer constellations! 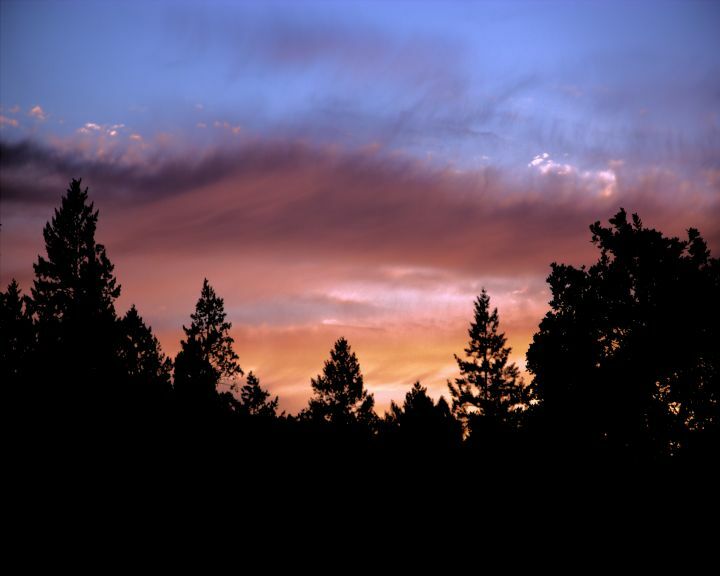 Whether at onen of our favorite spots at Lake Sonoma or at your location, we will give you a night of beautiful views to be remembered for a lifetime. The 4 large moons that orbit Jupiter are named Io, Ganymede, Callisto and Europa. 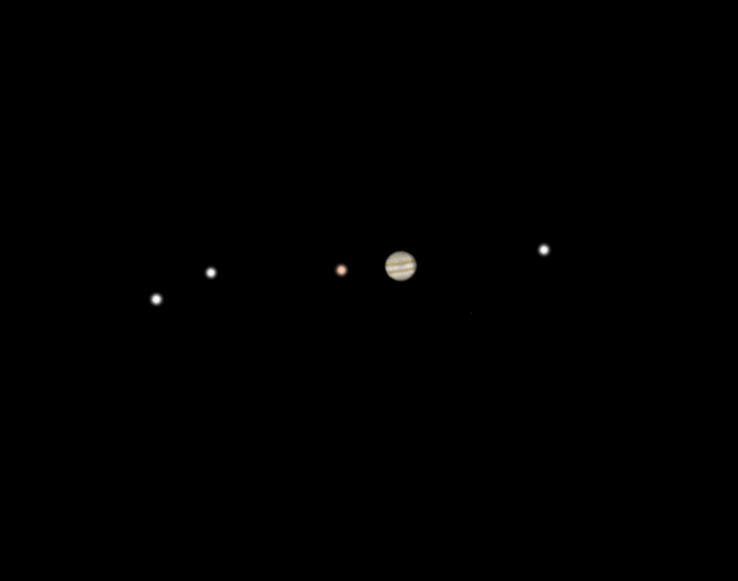 In total, there are over 50 moons orbiting Jupiter, but these 4 moons are the ones first viewed by Gallileo in the 1600s. In this video the planet and moons drift through the field of view of a stationary telescope. The planet and moons appear from the upper left. Wait for Jupiter to appear. The first object you see is Ganymede and is quite small. Jupiter does not appear until approximately 18 seconds have passed in the video stream. The field of view is quite small making the drift rate appear to be very fast. The weather is beautiful for stargazing and star parties. It is supposed to be close to 80F in Sebastopol and the rest of Sonoma County this week. Usually good conditions for stargazing include darkness (no full moon) and good transparency (no clouds) and good "seeing". Seeing related to turbulence in the atmosphere. Since a telescope looks thorugh miles and miles of atmosphere, wind and turbulence cause viewing conditions to degrade. Last night the dark and clear skies were still somewhat compromised as the Seeing was poor. The best way to anticipate good seeing is when the high pressure weather patterns set in and the middle of the high is centered on your viewing area. This will be happning in Sebastopol/Santa Rosa in a few days. Looking forward to it. and 4° north-northeast of the Andromeda Galaxy (M31). And the separation between the two objects decreases to 2.5° on April 4. Amateur astronomers who image should consider this a great photo opportunity. And visual observers should take this opportunity to compare the relatively nearby comet to M31, a vast spiral galaxy 2.5 million light-years away. Use binoculars to get an overall view, but a 4-inch or larger telescope with an eyepiece that provides a wide field of view will deliver the best results." We're hoping the Northern California weather will clear up enough for us to photograph the comet PANNSTARRS, near the spectacular Andromeda Galaxy! 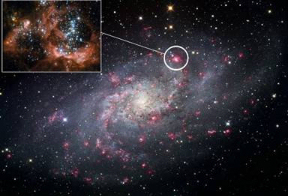 NGC604 is located in M33. What does that mean? NGC is an acronym for the "New General Catalog". M is an abbreviation for "Messier". These are ways of identifying deep sky objects. Many of the deep sky objects were "discoveries" claimed by early astronomers of the 1600s. 1700s and 1800s. The NGCs were primarly Englishman William Herschel's discoveries while the Ms were Frenchman Charles Messier's. Here is NGC604 "hiding" inside the bounds of M33. A friend was offering a used Celestron 5 inch ALT AZ scope so we bought it, It is fun to have a telescope that tracks unlike my Orion XT12. Plus at about 15 pounds it is easy to take out back for a quick view. The skies in Sebastopol (Sonoma County) are still a little cloudy tonight. Jupiter and the Moon are nice and bright. 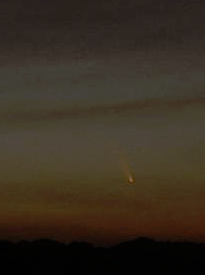 Here's a photo of the Pan Stars comet. This is a realistic view of what we saw last night. The photo was taken by WCSP's friend Mark from Napa California. It was very dim. It was north (to the right) of where we thought we were supposed to be looking. I was proud to find it, like I was a discoverer. I hope the comet next fall is brighter. Perhaps we will get larger photos of it. We saw the comet tonight. Very faint through wispy clouds. This was from the Sebastopol / Santa Rosa area looking toward Bodega Bay. At 8:00pm it was just to the right of the crescent moon and just above the horizon. The altitude was about 4 finger widths viewed over my outstretched hand. We saw a yellowish or golden glow, a tail and the main body clearly through a 4 inch reflector telescope and also with binoculars. 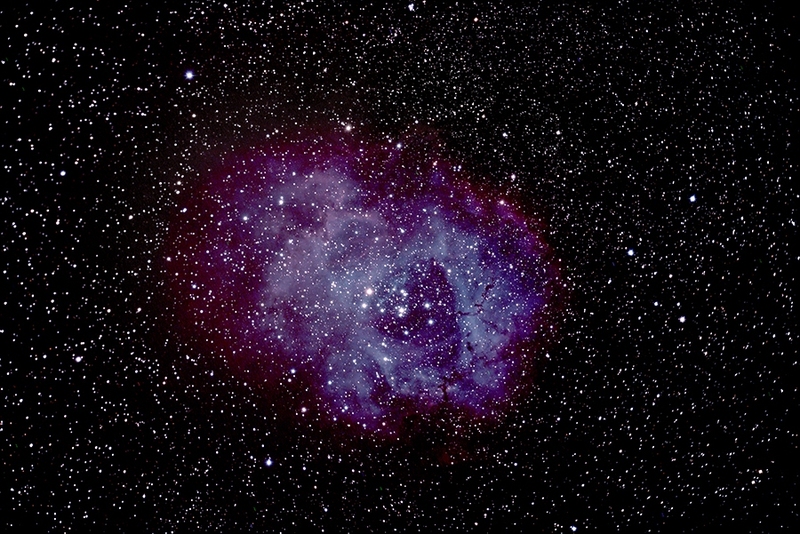 This photo of the Rosette Nebula was taken with our 10" reflector and a Canon T2i DSLR. We've really improved our ability to take photographs since we improved the positioning of our polar alignment scope. What this means is our 10" scope spends a lot of time clicking off images that are later "stacked" into one final image. There is over an hour of exposures in this image. This is magnficent. The detail is stunning. We found a new observing spot. Carlevaro Way near Goat Rock. VERY dark. You can here the sound of the waves crashing at the beach which is just a few hundred yards to the west. I always say that a site is dark if you can't see your feet. This spot was very dark - public - spacious - and low horizons. Part of the excitement of springtime astronomy is the Virgo Cluster. 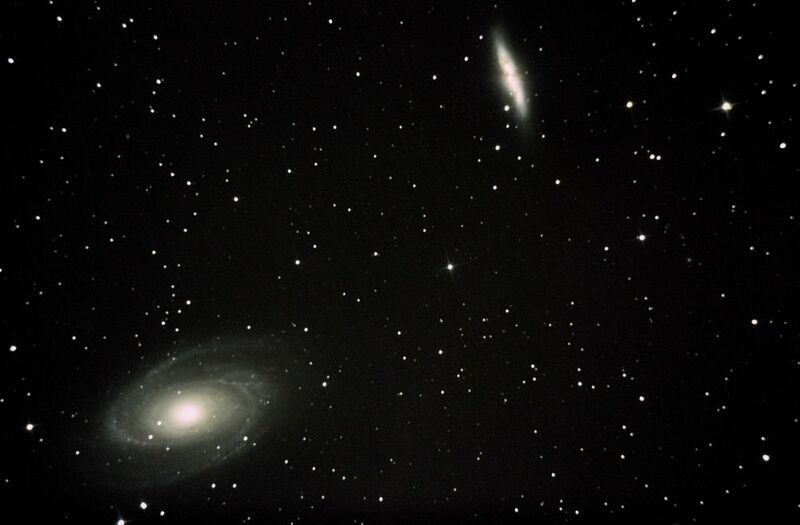 When viewing through a telescope, one can see multiple galaxies in a single view. It is very impressive! The cluster is very impressive between Denebola and Vindemiatrix. The Rosette Nebula. Located between Orion and Canus Minor. 5200 light years from Earth and approximately 130 light years in diameter. This photo taken in Blucher Valley near Sebastopol California 10 miles west of Santa Rosa. This image is a 20 minute exposure taken with a Canon T2i DSLR. This is not what one would see through a telescope with the naked eye. The camera's long exposure allows for the color and shape to resolve for viewing in this photo. Many of you are asking us about the Asteroid that is going to pass the earth this week, and if there's a chance for a collision. Here's a video that explains all about Asteroid 2012 DA 14. At 5:30am this morning, we can see Cygnus, Hercules, Bootes, Corvus, Scorpius, Draco, Ursa Major, Ursa Minor, Lyra, Corona Borealis, Opiuchus, Virgo, and Leo. Our first exposure to the details of the named Constellations was in the summer, so these springtime and summertime Constellations always bring back good memories. We view these sights from Sebastopol, CA, but of course any location in the northern hemisphere this time of year will give you the same view. This time of year, lots of Astronomers are taking photos of Orion - here's another. It is big and bright and colorful. One thing though, it is hard not to overexpose the center. 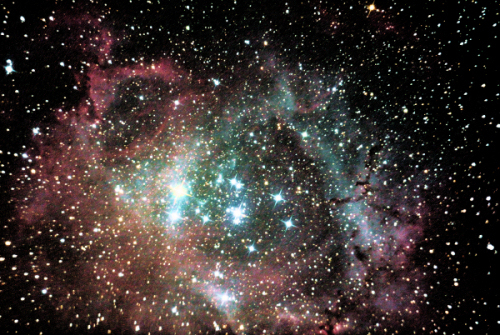 At the center is a cluster of stars called the Trapezium. These are stars that were born in the nebula. They are the reason the nebula glows. They are much brighter than our sun. Wine Country Star Party is playing Cupid~! Let us help you treat your sweatheart to a romantic and remarkable star gazing experience! Impress your loved one with an unforgettable night viewing the Winter and Spring constellations, many beautiful galaxies, nebula, star clusters and Jupiter and its moons. Wine Country Star Party will provide hot beverages, sweet treats, blankets, and zero-gravity chairs. Our basic Valentine's romance package starts at $130 per couple or we can create a custom event. 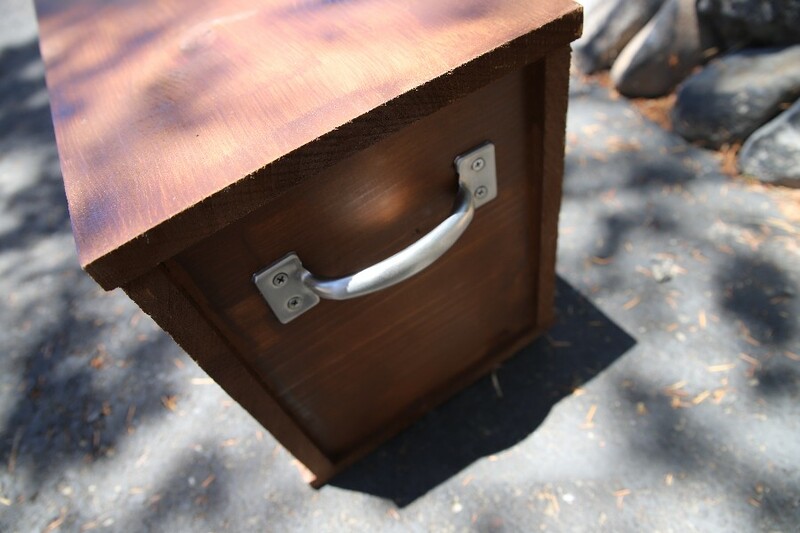 Call us at (707) 823-3631 to create a custom experience just for you! A first try. Look for longer and less light polluted editions in the near future. We've made some adjustments to the equitorial mount we use when we take astro photos. Look for more beautiful photos here Saturday after our photo session Friday night. We plan to be in a nice spot near Freestone in Sonoma County. It is a nice private parking lot at a residence. No cars driving by. No distractions. Lots of good dark sky overhead. Right now the Moon has just passed being full and is on its way to the "Last Quarter" and then the "New Moon". 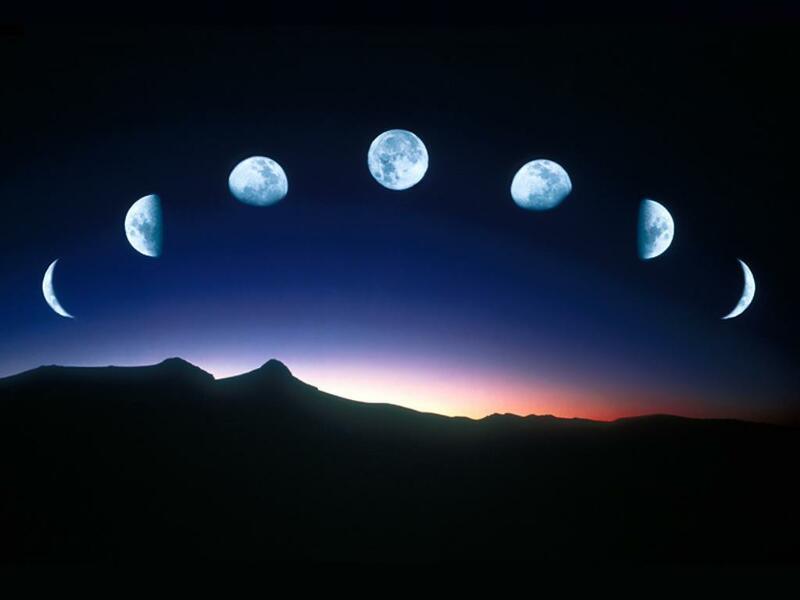 Since the Moon goes through its entire lunar cycle slightly faster than once a month it rises in the east a little less than an hour later each night. The Moon has to go through its cycle in about 29.5 days, And during those days it revolves around the Earth once only to reappear in the same spot in the sky. Think of that revolution as the face of a 24 hour clock. Since it revolves around the Earth in about 29.5 days and cycles through a 24 hour clock, it progresses to the East about 24/29.5 hours per night or an average of 48 minutes. Watch it tonight and make a note of Moon rise as accurately as you can. And watch it tomorrow night to see if it rises about 48 minutes later. This pattern is most predictable during the equinoxes since the view of the orbit is more uniform and not as off axis as during the soltices. Here it comes again - the full moon. Lots of astronomers stay inside because of two reasons. The moon is so bright, it washes out the sky so all the other objects are nearly impossible to see and when it is full, even though it is fully illuminated, the moon has no terminator - the line between dark and light. When the moon is a crescent, the terminator is the best viewing. The deep shadows along the terminator reveal great contrast between dark and light and one can see lots of detail. Fortunately, within just 4-5 days after full, the moon rises late enough at night to allow for a few good hours of viewing. I am looking forward to next weekend when that will be the case. We were just watching a show on the Discovery Channel that claimed 100 tons of meteor materials land on the Earth every day. Look toward the southeast during Winter - a little low toward the horizon - and you will see the brightest star in the sky - Sirius. If you are familiar with Orion's belt and the Constellation Orion in general, you will see Sirius below Orion. 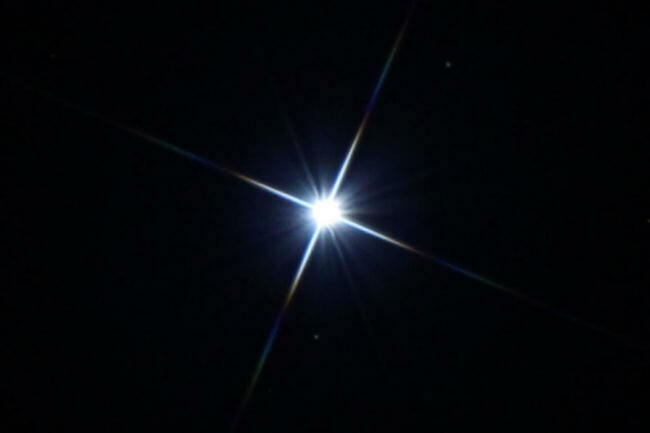 Sirius is bright because of its closeness to the Earth and its size. It is the "Dog Star" in Canus Major. While it rises in the summer during daylight, it was thought to add to the heat of the day, thus - the "Dog Days of Summer"
The four dramatic white lines that extend from the center of our photo of Sirius are called diffraction spikes. They are caused by the spider vanes that hold the secondary mirror in the tube of the telescope. Some Astronomers consider them defects or distractions. I think they give a bold and flashy look, Generally single stars do not make much of a photographic target anyway, so the spikes add to the effect. What do you think? We took this photo last night near Forestville. 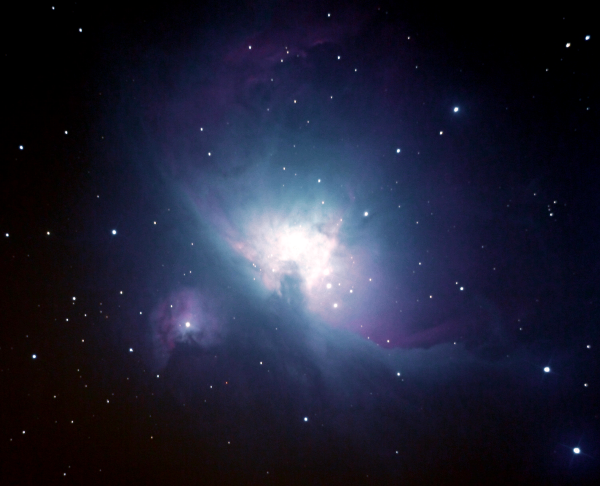 The "Orion Nebula" or M42. To continue the previous posts on early morning observations, we want to mention that Scorpius was visible early this morning. At about 5:00am, we could see Scorpius to the South. Normally it is thought of as a Summer Constellation, but lately we've been making observations during the time just before sunrise. Scorpius is marked by its bright yellow star Antares, and the three claw stars that evenly fan out to the West. I'm imagining what it would be like launching off Earth for a landing on Saturn here at this distance watching the planet continue to grow and grow . Astronomers love to tell people about the Constellations they see. The names are important. The locations are what make up the canvas of the night sky. There is a lot of detail and information about the seasons, the star names, and the objects located above. We have to watch ourselves and not overwhelm our guests with too much information. At 5:30am this morning, we can already see the Summer Constellations rising. It is very exciting. Vega and the rest of the Summer Triangle are visible to the east. The Spring features including the Big Dipper and its curved handle "arcing" to Arcturus and "spiking" to Spica are straight up. We've even added the additional pnuemonic - "curving" to the asterism Corvus. We would love to show you these features of the night sky. Don't think of us as "know it alls", but think of us as "share it alls" as we share our excitement with you. Thanks Bob C for taking this photo. It is of a sign in Windsor California. 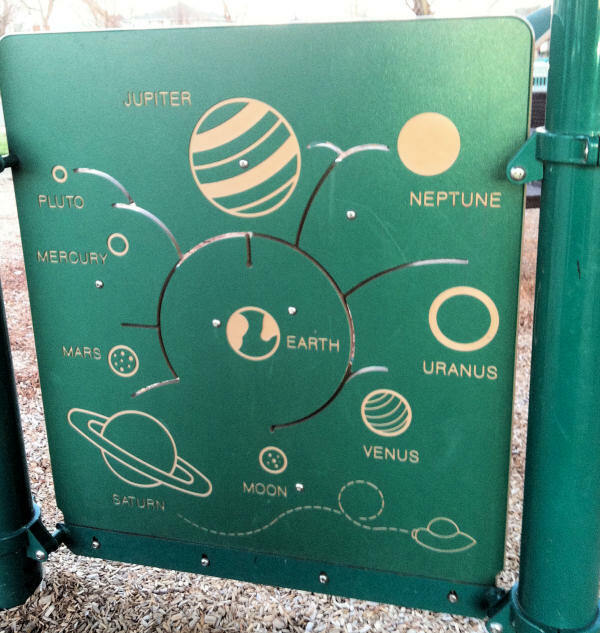 I like it that Pluto is still "recognized". The UFO is my favorite - it does a little loop-de-loo in its flightpath. 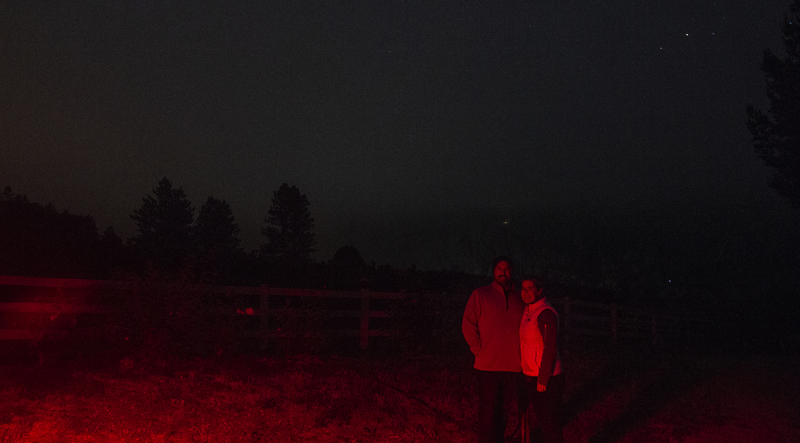 We went to the public star party at the Robert Ferguson Observatory (RFO) last night. Beautiful night! Despite the clear weather forecast, the skies were initially cloudy, but by about 7:00pm, the clouds cleared. What a treat. The Winter Hexagon was high in the sky and as the evening progressed, the Spring Constellations rose in the east. 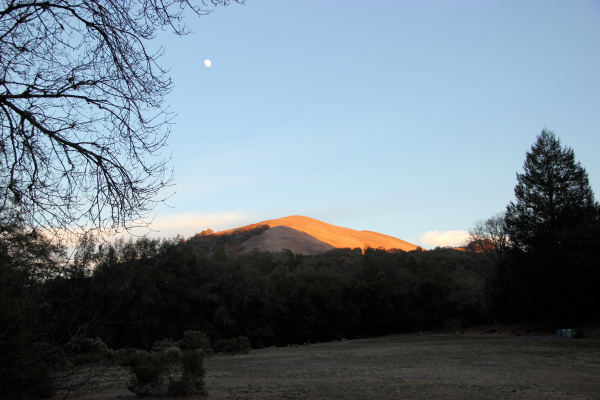 RFO is located in the Sugar Loaf Star Park near Kenwood, California. Despite the many State Park closures, "Team Sugarloaf" has formed and is keeping the Park open. Lots of good fellowship amongst the RFO Docents and guests as usual. Lots of good viewing. I always tell visitors to enjoy the viewing and tour of the Observatory, and as they return to their cars, they can always stop in the upper parking lot to get one last view of their favorite objects in the personally owned scopes owned by the Docents. Last night Dickson Yeager, Rob Davis and Nancy Cummings were set up with 3 Dobsonian Scopes. Did you see the Crescent Moon and Venus Thursday morning? This is just what it looked like, whether you were here in Sonoma County, or in Currituck, North Carolina, like photographer Greg Diesel.Walck. Enjoy Venus while you can, these January mornings. Soon it will be rising with the sun, & because it is the second closest planet to the Sun, (Mercury is the closest), it will be too bright to see by February first. Fear not though...Venus will 'return' to us in late April once again visible to us in the evening sky. By September 8th, it will be near the moon once more. In about a week, (Jan 21, 2013), the planet Jupiter will put on a show of its own with the moon. We like to think of these planets as lifelong friends, coming around to see us at different times in the night....and at different times in the year. In fact, it is this very thing that inspired Wine Country Star Party's logo of four stars. They stand for Spectacular Beauty, Memorable Friends. When a Planet or a Constellation has been gone from view for a time or a season, it is a wonderful reunion when they reappear, like an old friend we haven't seen in a while. When they put on a show, like Venus and the Moon, a new memory is made. Capturing the celestial beauty with photography is a wonderful way to remember the moment. With many of our pictures, even pictures of galaxies and nebula, we remember where we were and who we were with when the picture was taken. What Celestial wonder is most memorable to you? Saturn is also rising before 3:00am now. This time of year. there is a real stargazers's treat. Once you find and enjoy Ursa Major and the Three Leaps of the Gazelle, turn around 180 degrees and enjoy Orion. Last night, at about 10:30pm, I was able to see Ursa Major to the northwest and after turning completey around to face the southweat, there was Orion. One thing that is very exciting to me about these Constellations is their size. Both Constellations occupy huge sections of the sky and both are so well known. Usra Major for her Dipper and Orion for his belt. 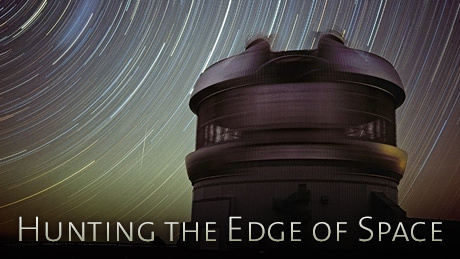 Today at 1:00pm on PBS there is a NOVA presentation of "Hunting the Edge of Space". A wonderful show about early Astronomers developing bigger and bigger telescopes. Part 2 is next week - same day and time. is one of the easiest stars to recognize in the night sky. and has more than 200 million times its volume. It outshines our sun by about 50,000 times. appearing more orange-red than the stars around it. that we could see the explosion of Betelgeuse in our lifetime. happened, when you consider that it is 430 light years away. 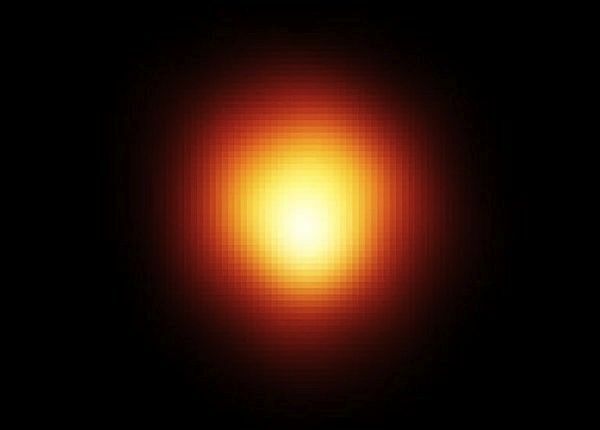 Get to know Betelgeuse now, in its supergiant form, before it explodes and becomes a supernova~! The name sounds impressive, huh? SCAS is the acronym. A great group of people who meet monthly at Proctor Terrace School in Santa Rosa, See the SCAS website at http://www.sonomaskies.org. One of the reasons we joined SCAS was to find good observing sites. We're frequently quoting the following: "a good site is harder to find than a sight". A dark location, on public property, with parking, but away from headlights and streetlights, with hopefully even a public restroom is hard to find. So after we joined SCAS we started asking if the club had access to good observing sites. And do you know what happened? We got put in charge of setting up star parties. 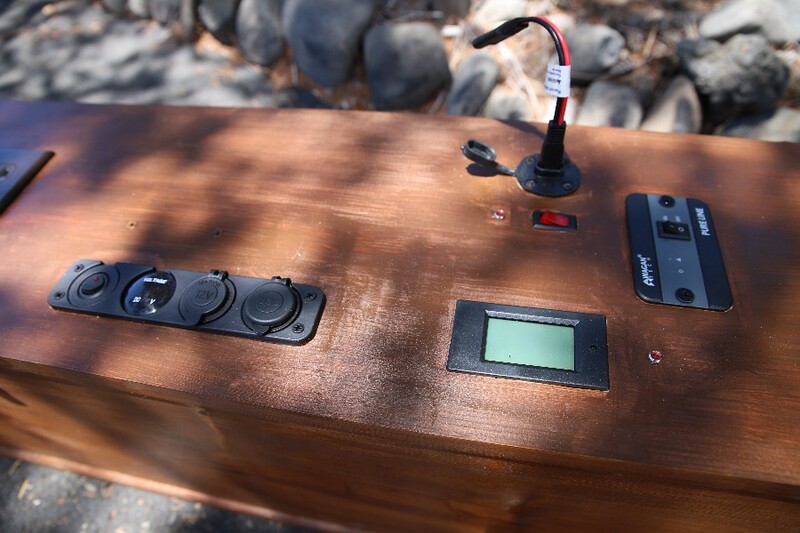 To date, we've set up only one and it was at Lake Sonoma. Lake Sonoma seems to be a desirable location for Central California Astronomers from the Bay Area and beyond because it meets most of the criteria spelled out above. 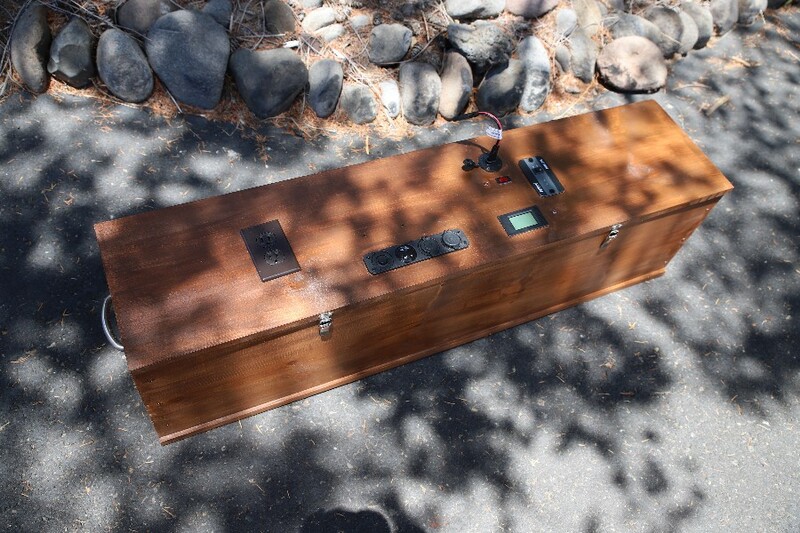 We were at Lake Sonoma in October and met a fellow at the Lone Rock parking lot who had a 24" Dob in his van. We did not see the fully assembled telescope, but he had driven there from the East Bay - over an hour from there. While walking outside last night, we could see the Great Square of Pegasus to the west. The Winter Hexagon was directly overhead. And the Spring Constellations of Ursa Major and Leo were rising in the east. So beautiful! The only thing missing was the Summer Triangle, but of course, at this time of year it is up high in the sky during the day and under our feet at night. 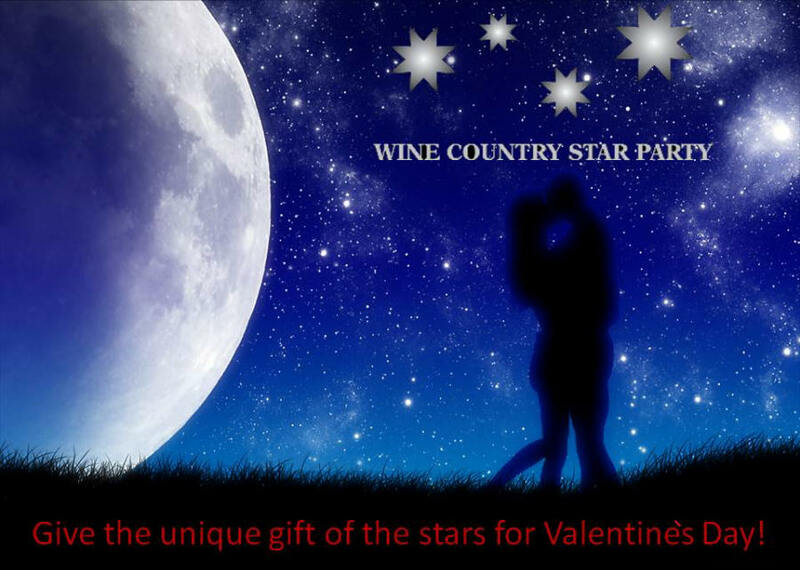 At Wine Country Star Party, the stars in our logo stand for "spectacular beauty, memorable friends". The seasonal Constellations are partly what we are referring to when we mention "spectacular beauty, memorable friends". 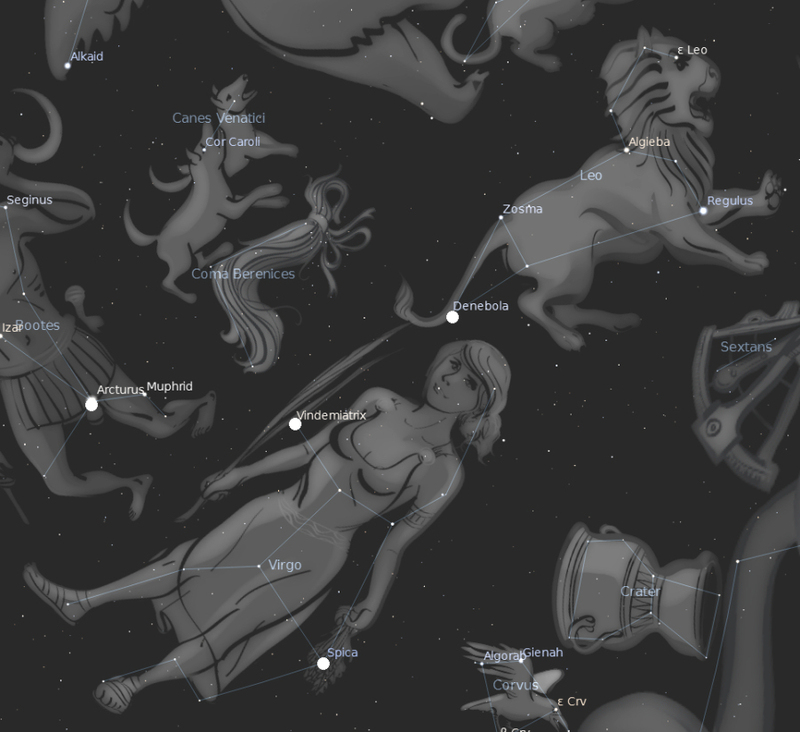 If you notice the Clear Sky Chart in the previous BLOG entry - it is "live". It is updated every day and uses the same web address so you can always see the current conditions at Lake Sonoma in this BLOG. You should consider learning about Clear Sky Charts. They are used by Astronomers frequently. A Clear Sky Chart helps predict viewing conditions with far more detail and accuracy than most weather maps. Cloud Cover, Transparency, Seeing, Darkness, Wine, Humidity, and Temperature are all predicted hour by hour. The predictions vary, but usually include the present time through the next 18 hours. This is definitely NOT a long term forecast, but it can yield a very detailed and accurate short term forecast. At one Star Party, we were able to reassure our clients that the Clear Sky Charts predicted an opening in the clouds at about 9:00pm and almost to the dot, that is when the cloud cover cleared. It was a little spooky that we forecast good conditions so well. Our guests loved it. A Star Party is an event where a group of people gather to stargaze. Naked eye and telescope aided observing are included. It is a peaceful time to view the beauty of the heavens. Stars, Galaxies, Open and Closed Star Clusters, and Nebula are all visible. In addition, the participants in a Star Party view Constellations and Asterisms associated with the season. Typically, fact sharing, stories, and mythological tales promote a heightened sense of camaraderie. A Star Party is not to be confused with a party for Movie Stars or Hollywood Actors. The phrase "Star Party" is used among astronomers as the common name for a gathering of people intent on viewing the Heavens. As the evening progresses, and darkness falls, there is a growing excitement. Objects rise in the east just like the sunrise and the experienced Astronomers point them out. As each person's eyes adapt to darkness, the ability to see dark objects improves. Gradually novices become more familiar with the map of the sky. Even a shooting star or two adds to the excitement. will be a mere 91,402,560 miles away. There are lots of good sales going on right now on telescopes and accessories. Just like other retailers, the telescope stores are promoting their products with discounts now that the holidays are over. Research carefully. We do not recommend you buy a telescope product at the Mall or Discount stores. Watch out for ads mentioning "high power" and "low price" as these are almost never good combinations in the telescope marketplace. Before you buy, consider contacting us for assistance or plan a visit to your local astronomy club for a little guidance. Happy New Year's Eve! Be safe tonight. We hope lots of you are assembling your new telescopes that were received over the Holidays. Contact us here if you need any help getting started. Tonight, before total darkness, at about 5:30pm, there was Jupiter. Nice and bright toward the east about 30 degrees up from the horizon. There were no stars visible yet but we could clearly make out Jupiter. Even only two days after the Full Moon while there is still too much moon light to enjoy a deep sky object, Jupiter gives a pleasing view and reminds us that the good dark skies are coming. Just after the Full Moon, the promise of darker skies begins. Not the kind of dark skies that people dread. You know, the analogy that darkness brings bad spirits and gloom. Rather, great astronomy viewing. In as few as three to four days after the Full Moon, the Moon starts rising late enough in the evening to offer good dark viewing just after sunset. By the end of a week after the Full Moon, we reach the "Last Quarter" and the Moon rises after midnight. Then for the following seven to ten days we have excellent dark nights for viewing including the night of the New Moon. You can use this page to calculate the rise and set times for the moon and sun. One of Wine Country Star Party's Moon photos from earlier this year. Taken with our 10" Newtonian Telescope. The last full moon of the year 2012 will shine on us tomorrow morning. The moon is one of the most interesting and easiest subjects for astrophotography. Send us your photographs of the full moon and we'll share them here on the blog! The moon is full again this Friday, December 28. Most Astronomers head inside to wait for darker conditions. There is a funny thing about that. The moon is such a great astronomy target - big and bright and lots of details. But we tend to avoid it since the deep sky objects are hard to enjoy while the moon's light washes out the sky. Also a view of the moon through a telescope of even only modest aperture can be uncomfortably bright for the viewing eye. This leaves you somewhat "blinded" in the one eye as you step away from the telescope eyepiece. Some find views of a crescent moon more intriguing than the full moon since the line between dark and light - called the terminator - is full of details. The details are from cast shadows over the edge of crators along the terminator. Merry Christmas Eve! We hope you have a safe and joyous Christmas Eve. Please travel safely and enjoy the spirit of giving. Take time to appreciate your family and friends. Wine Country Star Party wishes you a Merry Christmas. Within the Winter Hexagon is Auriga - the Charioteer. 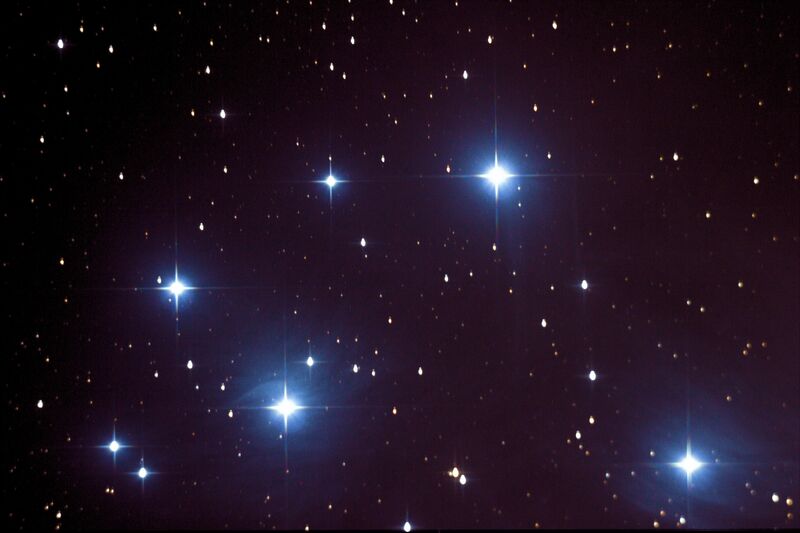 One of Auriga's stars - Alnath - is also shared by Taurus. Auriga holds a goat - the star Capella - and 2 goat kids in one hand. One thing that is exciting about Auriga are the presence of 3 Messier objects, M36, M37 and M38 - all visible with binoculars. All 3 of these objects are open clusters. 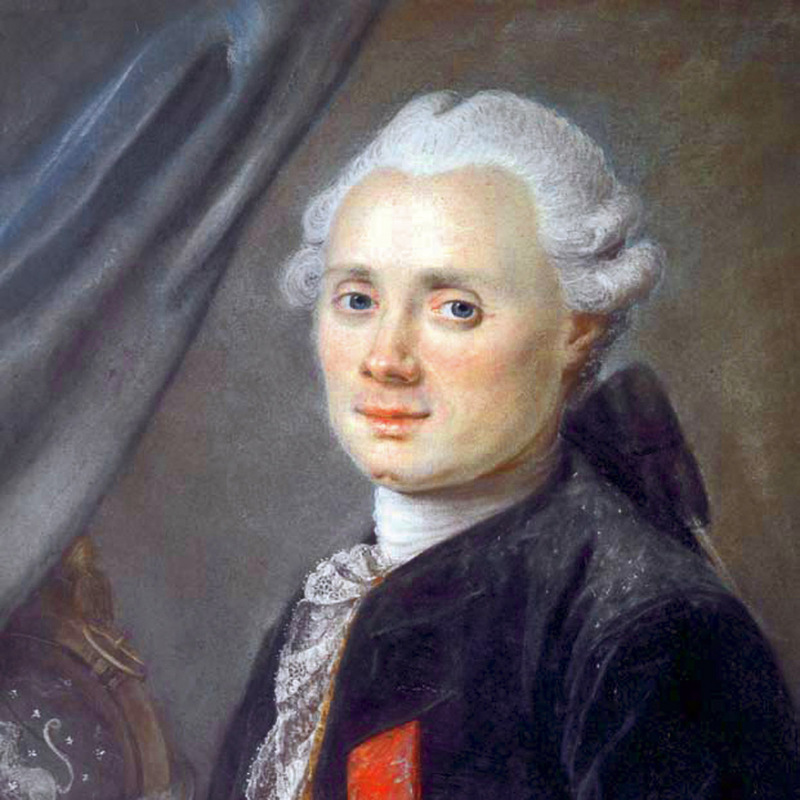 Charles Messier was a French Astronomer whose "list" is used by most Astronomers today. Messier lived in the 1700s and early 1800s and he and his Assistants identified 110 objects for the Messier List. The Andromeda Galaxy is an example of a Messier Object - it is called M31. Many Astronomers participate in "Messier Marathons" during which they try to identify as many Messier Objects as possible in one evening. During a Wine Country Star Party event, you are likely to see 10-20 Messier objects. It is fun to "check them off your list" so you can say, "I've seen that". The seasons of Winter, Spring, Summer and Fall bring unique patterns of stars to the night sky. Astronomers use these patterns as landmarks. The Winter night sky landmark is called the "Winter Hexagon". Stars inside individual Constellations are referred to as "asterisms". The six stars of the Winter Hexagon are some of the brightest stars in the sky. Actually, there are 7, but in terms of defining a hexagon, the Gemini Twins count only as one. Sometimes on a foggy night, you can see them shine through the fog, making it simple to see the shape of the hexagon. At the time of this writing, Jupiter and its 4 Galilean Moons are located inside the Winter Hexagon, and is clearly visible in our telescopes. One can see so-called bands and zones on Jupiter at the boundaries of storms on the planet surface. The great red spot on Jupiter is a storm that has been going on for over 300 years. Wine Country Star Party has multiple eyepieces to allow for either wide angle views that are very clear to high magnification views that reveal inspiring detail. A dazzling object called the Orion Nebula is below Orion's belt in the southern portion of the Winter Hexagon. Constellations within the Winter Hexagon include Auriga, Taurus, Orion, Canis Major, Canis Minor and Gemini. All of these features and more are part of what you can expect to see now through Springtime. One of the services Wine Country Star Party provides is assistance setting up your new telescope. Perhaps you'll get a nice gift for the Holidays. Let us help you take it out of the box and assemble it. We can take the guesswork out of the process and help you get outside to view your first astronomical objects. Welcome to the Wine Country Star Party BLOG. We will post information here about our Star Parties. We will also post details about the seasonal skies. As the seasons change, there are noticeable changes in the "landmark" constellations. These are the constellations Astronomers use to "get their bearings".